On this page ... Abbay, Adamson, J. T. Alcock, Allison, Austin & Pickersgill, page bottom (aircraft carrier). Copyright? (1 + 2 + 70 = 73) Test. It would seem that the shipbuilder (William Richard Abbay) was born in Yorkshire in 1820 or 1821. He occupied a shipbuilding site at Ayre's Quay from 1845 to 1858. Ayre's Quay was, & maybe still is, located on the Deptford 'peninsula' a little below & to the south east of where Laing's had their Deptford shipbuilding yard. Who occupied his yard site before & after him? I cannot today tell you. But we do now have an 'Abbay' build list on site, here, containing 23 vessels in total built in the years from 1845 to 1858. A 3 masted wooden barque. Per 1 (data, Lansdowne 1873), 2 & 3 (1863 & 1864, New Zealand), 4 & 5 (1859 & 1867 Australia). Not listed at Miramar. It is a pleasure to find an eBay listing for a vessel built by a Sunderland shipbuilder that I had not heard of before. Such was so re this vessel via a listing by 'scott-base', of the U.K., whom we sincerely thank. 151.0 ft. long, signal letters MBJC. Was always registered at London. Built as Lansdowne for Vickerman of London for service from London to Australia. In 1869/70 Mainprize Bros., also of London, became the vessel's owner. The Mercantile Navy List of 1870 advises us that George Mainprize, of Flamborough, Yorkshire, was then her owner. In 1871/72, J. Whyte & Co. of London became her owner. 1 references the ship being sheathed in felt & yellow metal in 1873, & fastened with copper bolts. And also partial new keelson in 1862, some repairs in 1862 & 1867, & repairs to damages in 1873. A voyage to India, also. 2 refers to a vessel of the name & tonnage arriving at New Zealand on Feb. 4, 1863 from Melbourne, Australia, with sheep & 10 passengers. On Dec. 15, 1864, the vessel arrived at New Zealand from Gulf of Bothnia with wood (deals). Many captains it would seem. The Mercantile Navy List of 1880 lists Jas. Whyte of London as her then owner. The vessel was sold in 1883, to Edw. Stangebye of Norway, & renamed Monarch. A number of later Norwegian owners it would seem. Broken up at Stavanger, Norway, in or about 1904. Can you add anything? Can you help with the history of these shipbuilders? The above list is surely incomplete. The webmaster learns of these shipbuilders thanks to Margot Jorgensen of Courtenay, British Columbia, Canada. Margot's great great great grandfather, her great great grandfather, & her grandfather were all named William Adamson. For ease of understanding perhaps I should identify them here, for clarity, as being respectively William Adamson #1, #2 & #3. William Adamson #1, was building ships at Monkwearmouth as early as 1809. By 1811, the business became 'William, James and William Adamson'. And soon became 'W. Adamson & Sons'. Which business moved to the Pann's area of Bishopwearmouth in the 1820s. In 1825 the Dove was launched. And later that decade, in 1828, it would seem that William Adamson #1 retired, & William Bell joined the partnership which became 'Bell and Adamson'. The business closed in 1840, likely another casualty of the hard economic times of the 'Hungry Forties'. About 70 ships were built during that whole period of 1809 thru 1840. In Mar. 1842, the yard was put up for rental, as you can read here. The business started up again in 1855, at Pallion, under William Adamson #2 (1815/1884). At a site which later became part of the Doxford yard - Doxford High Yard? Note that it is not 100% certain that the two William Adamson's, i.e. #1 & #2, are blood related, but it may be so, since Margot's grandfather, William Adamson #3 (1889/1977), claimed to have in his possession the christening bowl from the 1825 launching of the Dove. That data may well need correction & refinement however. Why do I say that? Because I read here, in an extensive article written by John Thompson in 1891, that in 1846, S. P. Austin & Son (but likely Peter Austin instead, since S. P. Austin & Son seems to come later) moved their facilities from North Sands to the Panns area on the south bank of the river just east of the road bridge. And beside them at North Sands was the Adamson's yard! In 1846! It would seem that the Adamsons then had two shipbuilding yards, one at Panns & the other at North Sands. The article further indicates that 'Some few years afterwards the Adamsons removed from Sunderland to Birkenhead, near Liverpool'. That last comment ties in tidily with data supplied by Stan Mapstone (thanks!) which stated that there is no mention (of Adamson) in the 1850 & 1851, Sunderland, I presume, directories. Now that article further refers to Experiment, (built 1845, I think) a ship probably built by the Adamsons but described in the following words relative to the use of screw propellers - 'The first harbinger of the change likely to take place was seen in a portion of the yard then occupied by Mr. Adamson, North Sands. A large wooden vessel, intended at first as an ordinary sailing ship, was being built by and for the late Mr. Ray, on the opposite side of the river. (Webmaster's comment: Whatever does that mean? Did Adamson build Experiment or did he not? J. A. Marr states that Adamson did build it). After the vessel had been advanced, he entertained the idea that she could be conveniently converted to a steam ship. Accordingly, if I am rightly informed, Mr. R. Thompson, then a young man, was engaged, in connection with the late Mr. Thomas Rowntree and Mr. John Brunton (the latter being first surveyor Lloyd&apos;s had in Sunderland), in making the necessary alteration and additions, to adapt the vessel&apos;s after-end to admit a screw propeller, which was considered a work of great skill in those days. Experiment was not a success, indeed it might fairly be described in the fullness of time as being an underpowered failure. But Experiment surely advanced the use of engines in ships & was, in its time, a significant step forward in that direction. Data exists today re the 1855 & onwards business of William Adamson (i.e. #2). A build list is available of the ships that he built over the years of 1855 thru 1870, thanks, I understand, to David Ingram & to records at the 'Tyne & Wear Archives' ('Archives'). 27 in number but likely that number should be increased to at least 33 since the notes of Margot's grandfather covers 6 additional vessels not referenced by Archives. The vast majority of the ships built at Pallion were for the Adamson family I read. It is hoped to soon have, in these pages, a list of those 33 vessels. In the meantime there is a list of 'Adamson' ships built over the entire period of 1809 thru 1870 here. Which list comprises 88 vessels (1809/1840, i.e. Adamson #1) & 30 vessels (1855/1870, i.e. Adamson #2). I have not checked re the availability of actual data re the early 88 vessels. Re the later list there is, as this is written, no actual data re any of them. After 1870, the Adamson family would seem to have been ship owners only. Was such ownership both direct & indirect? I read that the family owned 25% of 'James Westoll Line', a prominent Sunderland shipping company with a great many vessels. One of their fleet vessels was named after the family, i.e. William Adamson, built in 1884 by Short Bros. And Margot's grandfather also referred to Shakespeare, built by Short Bros. in 1876 for Wm. Adamson. Margot's grandfather worked for Robert M. Sloman, of Hamburg, Germany, in 1908 thru 1910, it is believed learning the ship owning business. There is a some interesting information about the Adamson's here. There is a reference to 4 ships being built by Bartram's in 1865/8 for Jas. Westoll & John Adamson (1821/1871), (ref. to John Adamson on this page), here (about half-way down, see #24, #26, #28 & #30). There is also a reference to the family (J. Weston Adamson & E. E. Adamson) owning Vedra Shipping Co. Limited, in 1957, here. But there clearly is a lot more to be learned about the shipbuilding & ship owning history of the Adamson family. If you can add to the knowledge, do please consider being in touch. A wooden barque which was launched on Aug. 10, 1839, as per this (in red) contemporary announcement. Per 1 (data), 2 (Don, court case), 3 (1842/3 at top & 1864/65 Lloyd's Register listings). The vessel is Lloyd's Register ('LR') listed from 1839/40 thru 1864/65. Built for own account, i.e. for the account of William Adamson, of Sunderland, but from 1842/43 rather of Liverpool & from 1851/52 of London. Crew all told approx. 22/24, I have read. I am advised that the vessel had the distinction of being the largest ship built on the River Wear in 1839. From 1859/60, LR advises that 'W & A. Adamson' built her. I am puzzled (1) with the reference to 'Adamson' being of New York, the ship going to New York to be completed (fittings etc. ), & her maiden voyage being in 1841. Can anyone explain all of that? I believe that, per LR, the vessel simply traded from Sunderland to New York from 1839/40 thru 1841/42 with 'Pringle' serving as her captain. W. Greyson became her captain in 1842/43 for service from Liverpool to Bombay & Calcutta, both India. Service to India continued in 1843/44 under Captain Potter to Calcutta & Bombay, & to Ceylon (now Sri Lanka) & Calcutta ex London in 1845/46 & 1846/47. J. Bell became her captain in 1846/47 & served as such thru 1857/58 per LR with many voyages from London to Australia (see below). The vessel served ex the Clyde in 1857/58. In 1858/59, the vessel, now per LR of 658 tons, served India ex Leith, Scotland, under Captain Aitkenhead, her captain thru 1864/65. Service from London to Manila, Philippines, is LR referenced in 1862/63 & 1863/64. Details re the vessel's many voyages to Australia. 1) The vessel sailed from Plymouth, Devon, to Cork, Ireland. And on Jun. 18, 1841, left Cork for Port Philip, Melbourne, Australia, chartered, I read, by J. B. Were, & under the command of Captain (William) Greyson. It arrived at Port Philip on Oct. 3, 1841 with 10 or 11 passengers & 241 bounty emigrants - Irish labourers & their families. So far as I can see, the vessel went on to Sydney with Barker serving as her captain. (1, 2 typhus, 3 detail & list of emigrant names). 2) On May 20, 1848, the vessel left London for Sydney, New South Wales, via Plymouth, with Government stores & 31 passengers, under the command of Captain (John) Bell. It arrived at Sydney on Sep. 11, 1848, after a voyage of 109 days & left for London on Jan. 11, 1849 (1, 2 part of her cargo). 3) The vessel left London on Jun. 24, 1849 for Sydney, captain Bell in command, arriving there on Oct. 20, 1849. With cargo & 13 passengers. She left Sydney for London on Jan. 25, 1850 with 5 passengers & a varied cargo which included shipbuilding timbers, wool & oils. 4) On Nov. 6, 1850, the vessel arrived at Sydney having left Falmouth, Devon, on Jul. 26, 1850. She left Sydney for London on Feb. 15, 1851 with a dozen passengers & a varied cargo that included copper ore & wool. It arrived back in the U.K. on Jun. 20, 1851. 5) On Aug. 15, 1851, the vessel left Gravesend, London, for Sydney, arriving there on Dec. 15, 1851 with 6 passengers & cargo. With a crew of 22, all told, I read. She left for London on Apl. 6, 1852 with a cargo that included 5,550 oz. �22,000 of gold, & arrived at London on Aug. 15, 1852. 6) On Nov. 9, 1852, the vessel left Torbay, Devon, for Moreton Bay (Brisbane, Queensland), Bell in command, with 263 emigrants. There were many deaths en route, particularly of children. It arrived at Moreton Bay on Feb. 26, 1853 with 246 emigrants aboard, 107 of which were under the age of 14. The vessel went on to Sydney (arrived Jul. 6, 1853), left Sydney on Jul. 23, 1853 & arrived at London on Dec. 4 or 5, 1853 (emigrants). 7) On Apl. 17, 1854, the vessel (Bell) left London for Sydney & arrived on Aug. 23, 1854 after a 'tedious passage' of 128 days. It left for Guam on Oct. 12, 1854. That is all I could find. Were there more? On Sep. 7, 1842, the vessel arrived at Liverpool in ballast, having discharged her cargo, loaded in Calcutta, India, at the port of London. The vessel took a pilot on board entering the Mersey, but collided with Don, a schooner, & damaged Don & probably itself too when it came to rest against the King&apos;s Dock basin wall. The court held that the pilot was solely responsible, that Agricola's master (Grayson) bore no responsibility at all & that Agricola did not have to pay for the damage to Don. What finally happened to the ship? So far as I can see she was last recorded in Lloyd&apos;s Register of 1864/5 with the notation 'Abandoned'. Can you tell us what happened or otherwise add anything? An image? A wooden barque. Per 1 (data, Fluellin 1879), 2 (1869/70 & 1883/84 Lloyd's Register listings). 141.5 ft. long, signal letters JMKT. Built for own account, i.e. for the account of William Adamson, of Sunderland (but registered at London) who owned the vessel per the Mercantile Navy List in 1870 thru 1880 & 1885 also. 1 references the ship being sheathed in yellow metal & partly in felt in 1880 & fastened with copper bolts. Which would describe most wooden ships, I suspect, & therefore does not add very much! The webmaster can only access such Lloyd&apos;s Registers as are WWW available. The vessel is listed in the 1883/84 edition, as above, but is not in the 1885/86 edition. I read (insert 60911) that the vessel was burned on Dec. 23, 1884 & was removed from the registers in 1885. Can you provide details as to the circumstances of the vessel's loss? Or otherwise add anything? Can you help with the history of these shipbuilders? It would seem that 'John L. Allcock' occupied a site on the south bank of River Wear, a site which was later taken over by Scotia Engine Works. Builders of wooden ships. For many years, I was aware only of Thalia, a brig of 299 tons built by Alcock in 1864 for T. Adamson of Sunderland. Which helps re the applicable dates. But there are now many more vessels listed on that 'Thalia' page, also built by Alcock. The above heading & text was re 'Alcock and Glaholm' until Clive Ketley kindly provided an image of an auction notice for a vessel built by 'Alcock and Glaholm'. And in WWW searching for 'Alcock and Glaholm' (no luck), I found a reference to 'John L. Alcock', shipbuilder, of Low Street, Sunderland, in business in 1861. Are the names related? I do not know - hopefully a site visitor will be able to provide more data. The auction notice? A portion of it can be seen at left. The whole notice can be seen here. It was for a vessel named Allison, which had been launched on Nov. 1, 1863 at the yard of 'Alcock and Glaholm' - offered for sale by John Miller, Auctioneer, on Nov. 1, 1864. Captain Jacobs was then her owner it would seem. Now I cannot spot a vessel of the name in Lloyd's Registers of 1863/64 thru 1866/67, but the purchaser may well have renamed her. There was an earlier vessel of the name, built at Sunderland in 1846. A guestbook message advises us that 'The Father of Modern Sport. The Life & Times of Charles W. Alcock', by Keith Booth, published by Parrs Wood Press, of Manchester, in 2002, refers to the shipbuilding history of J. L. Alcock. Its cover. Can you tell us what it says? Can you help with the history of the Allison shipbuilding family? It would seem that they occupied a site on the river, on North Sands, and that the Allison family was involved with shipbuilding from 1818 to 1833. Builders of wooden ships. The only reference I have so far seen to the shipbuilder was that 'this gentleman always had trouble launching his ships because he habitually placed the ways too far apart, with the sad result that during the launch, the vessel would slip between the two of them.' In 1833, they sold the business to Peter Austin. James Allison (1796/1865) was twice the Mayor of Sunderland. A fine image of him, taken in 1864 in full regalia, is available here. A prominent family in Sunderland history, it would seem. Austin & Pickersgill Limited was formed in 1954 by the merger of S. P. Austin & Son Ltd. & W. Pickersgill & Sons Ltd.
Austin & Pickersgill Limited took over Bartram & Sons Ltd. in 1968. In late 1976, I think, the company published an 20 page booklet entitled 'Austin & Pickersgill Limited 150 Years', available here. It covers the history of the three companies which together came to form the company i.e. 'S. P. Austin', 'Wm. Pickersgill' and 'Bartram and Sons.' And sets out the company&apos;s then plans to both reconstruct & expand the shipbuilding facilities located at Southwick. I see that Tom Pickard, a 'writer in residence' at Austin & Pickersgill's for 6 months in 1976, wrote a hardcover book about the yard entitled 'We Make Ships', 295 pages, published by Secker and Warburg in 1989, ISBN 0436369605. I read that Queen Elizabeth II visited Austin & Pickersgill Limited on Jul. 15, 1977, on the occasion of her Silver Jubilee (1952/1977). It perhaps should better be described as a 'shipyard drive-through', since the procession of cars did not in fact stop. Or maybe not even slow down very much! Local schools were invited to attend, & one youngster later commented - 'The Queen went past like greased lightning'. To commemorate the drive-through, Austin & Pickersgill arranged for a special posting box to be located in the main shipyard offices on that day into which employees could post their own 'souvenir envelopes'. When the postman emptied the box at the end of the day each envelope was hand stamped to show that it had been posted at the shipyard, following which the envelopes were taken away by the postman to the Sunderland sorting office where each one received a postal cancellation using a special hand stamp. All said & done, folks were grateful that the Queen had included the shipyard in her country-wide Jubilee Tour. All as you can see here (a page from 'A and P News', the company staff magazine) & also here. In 1986, Austin & Pickersgill Limited & British Shipbuilders Ltd. merged to form North East Shipbuilders Ltd.
Names of just a few of the vessels constructed by 'Austin & Pickersgill' of Sunderland - as I happen to spot references to them. In a table in build date sequence. A list of SD14 vessels built, mainly by Austin & Pickersgill Limited. Can anybody explain the anomaly in the hull numbers recorded below. There are hull numbers in the 300/400 range. And also numbers in the 800 range. There must be a reason why that was. A matter possible compounded by differing data as to which yard built a particular ship - particularly in the years after Austin & Pickersgill was first formed & later when Bartram's was acquired. With the help of Alan Vickers, let us try to explain - do note, however, that the words that follow, with whatever errors they prove to contain, are mine alone. In outline it would seem, provided we don't get too picky as to the detail, that the last build # at the Pickersgill yard, in or about 1961, was #378. Similarly, the last build # at the Austin yard was #436. Add those numbers together & you get #814. So the #817 hull number for Booker Venture 'kind of' follows on if you ignore #815 & #816 which numbers seem not to have existed. Later, in or about 1978, the last build # at the old Bartram yard was #464. By then the last build # at the old Pickersgill yard was #912. Add those numbers together & you get #1376. So #1377 the next number in sequence was used re Empros & #1378 re Cluden. Not explained yet is why Suniper & Bobbina, modest vessels also, I think, built or completed at the old Austin Wear yard in 1962 & 1963, were numbered #823 & #824, in a sequence that basically seems to have related to the old Pickersgill Southwick yard. To the webmaster, a quite confusing scene, especially in the detail, which is often difficult to define in a few words. With most likely errors in recording within these pages who built a particular ship. Miramar lists (highest hull number on page). It used to be that you could click on the links that follow & get to the relevant Miramar page. But no longer! The new procedure must be to go to Miramar (here) & log in (you must be registered to view any page). And once you are logged in, return to this page & all the following links should work for you:- 436 & 825, 364 & 824, 867, 897, 912 & 1395, 1432. (186). Vessels built by Austin & Pickersgill Limited at the Southwick yard that used to be owned by 'William Pickersgill & Sons Limited'. A cargo vessel. Per 1 (image, Baron Kinnaird), but you must be registered to access it), 2 (NZ), 3 (Miramar, link, you now must be registered to access). 141.8 metres (462 ft.) long overall, 132.8 metres perpendicular to perpendicular, speed of 13 1/2 knots. Built for Hogarth Shipping Co. Ltd. (Henry Hogarth & Sons the managers) (Baron Line), of Glasgow, but the ship was registered at Ardrossan, Ayrshire, Scotland. The owners of the Baron Line had, at one time, I read, a reputation for being 'economical' when feeding their crews, and, as a result, the line was nicknamed the 'Hungry Hogarths'. Visited Auckland, New Zealand, twice - in 1965 & 1966. Sold in 1968, for about U.S. $1.6 million, to 'Artagan Shipping Co. Ltd.', of Monrovia, Liberia, & renamed Artiba. Initially registered at Panama & then at Liberia. The vessel was sold in 1976 to 'Palmist Shipping Corporation S.A.', of Piraeus, Greece, & renamed Palmis. Became Arma in 1984, owned by 'Arma Shipping Ltd.', of Valetta, Malta. At or about May 20, 1985, the vessel arrived at the Alang, India, facilities of 'Ghaziram Gokulchand Shipbreaking Co.', to be broken up. Do you have more data? A cargo vessel. Per 1 [H. Hogarth, Baron Pentland (2)], 2 (NZ), 3 (Miramar, link, you now must be registered to access). 465 ft. 1 in. long (141.8 metres) overall, 435 ft. 11 in. long (132.9 metres) perpendicular to perpendicular, speed of 13 knots, signal letters GXTQ, later 9FCH2. Built for 'Kelvin Shipping Co. Ltd.' which was one of three companies owned by Hogarth Shipping Co. Ltd. ('Hogarth1'), with Henry Hogarth & Sons Ltd. ('Hogarth2') the managers, all of Glasgow. Collectively known as Baron Line. (Miramar indicate, however, that the vessel was owned by Hogarth1 & in 1966 by Hogarth2 (the 1966/67 Lloyd's Register so states). The ship was registered at Ardrossan, Ayrshire, Scotland. The owners of the Baron Line had, at one time, I read, a reputation for being 'economical' when feeding their crews, &, as a result, the line was nicknamed the 'Hungry Hogarths'. The vessel visited Auckland, New Zealand, three times between Feb. 1, 1960 & Aug. 22, 1965. It was on one of those voyages that Archie Linton was aboard. He was just 16 years old & a galley boy. Archie has kindly provided his memories of that 'round the world' voyage - an account that you can read here. The vessel was sold, in 1966, to Rio Pardo Cia Naviera SA, of Andros, Greece, & renamed Aghios Nicolaos. In 1984, the vessel was sold again, to Mercury Shipping Ltd., of Valetta, Malta, with no change of vessel name. On Mar. 2, 1984, the vessel arrived at the Gadani Beach, Pakistan, facilities of 'Yagub Sons Ltd.', to be broken up. Actual break-up commenced on Mar. 18, 1984. The seems to be very little WWW data available about this vessel. Can you add more? A cargo ship. From 1 ['Trader Navigation', Durham Trader (2)], 2 (image, Durham Trader), 3 (fine image, Durham Trader), 4 (Clan Keith), 5 (NZ), 6 (1982 image, Miho Pracat, data), 7 (image, Miho Pracat, but you must be registered to see it), 8 (Miramar, link, you now must be registered to access). 145.7 (or 140.25) metres long, speed of 12 1/2 knots. Built for 'Trader Navigation Co. Ltd.', of London, the 2nd fleet vessel of the name. Visited Auckland, New Zealand, 3 times between Sep. 1959 & Dec. 1960. In 1961, the vessel rescued 5 crew members of Clan Keith, 7129 tons, which, on Nov. 5, 1961, in a strong gale, hit the Ecueils des Sorelles Rocks, off Cap Bon, Tunisia, & broke in two. It would seem that the vessel exploded upon impact. 2 others were rescued by Nunnalahti, but one of them soon died. So 62 lost their lives. The Clan Keith Captain, (Capt. L. G. W. Pitts), who survived, was held to be at fault & lost his license, perhaps? The vessel was sold, on Dec. 21, 1965, to 'Atlanska Plovidba d.d.' of Dubrovnik, Croatia, & renamed Miho Pracat. On Dec. 19, 1983, the vessel was sold to 'Eckhardt Marine', of Hamburg, Germany, but 3 days earlier, on Dec. 16, 1983, it apparently had arrived at Alang, Gujarat, India, to be broken up. Can you add anything! An ore carrier. From 1 (data, & image Siroco), 2 (image Iron Ore), 3 (Vallum Shipping (Ship) Company ref. 40% down), 4 (Miramar, link, you now must be registered to access). 157.5 metres long overall, 147.8 metres perpendicular to perpendicular, speed 13 knots maybe. David Ferry advises (thanks David!) that he was a student apprentice fitter & turner when the ship's Clarke Sulzer 6/8 Cylinder RD 760mm bore super charged engines were built & installed. He remembers vividly the installation in the ship of the heavy crankshaft - at low tide. The next morning (at high tide) he arrived to find the engine room flooded - the ship had been resting on the bottom & some of the unconnected sea water inlet valves had been left open. The language used at the time could not be included in these pages - David describes it as being 'most educational'. Later he always followed the voyages of Iron Ore when he could � he felt that a part of him was in that ship. The vessel was built for 'Vallum Shipping Company Ltd.', of Newcastle, which company was owned by 'Common Bros Ltd.' & Jardine Matheson Limited. It was probably managed by 'Common Bros Ltd.' & likely chartered to 'Bisco' for its first ten years. 'Norman' has advised via the guestbook (thanks!) that he used to work for that company (British Iron & Steel Company, then an arm of the British Government, but now owned by Tata, of India) which coordinated shipments of iron ore into such U.K. ports as Birkenhead, Port Talbot, Irlam, Manchester, Immingham, Workington, Glasgow & Redcar - often from Canada. And, of interest to this site, also directed at which particular facility ships would, at the end of their lives, be scrapped. The vessel was sold, in 1969, to 'Cia. de Navegacion Siroco S.A.', of Liberia & renamed Siroco. Registered at Liberia. It was sold again, in 1981, to 'Volcano Shipping S.A.', of Panama, owned by Greek owners it would appear, & renamed Skyros. And sold in 1985 to 'Medora Shipping Co. Ltd.', (or maybe Inc.) of Panama, & renamed Gamboa. On May 19, 1986, the vessel arrived at the Aliağa, western Turkey, ship breaking facilities of &apos;Yazici GS&apos; to be broken up. We thank Henryk Jarzebek for the location of Aliağa - I had thought Aliağa was in Spain. WWW data is most limited. Can you add anything! A cargo vessel. Per 1 [H. Hogarth, Baron Wemyss (3)], 2 (image, Baron Wemyss), 3 & 4 (images, Bordabarri), 5 (Miramar, link, you now must be registered to access). 141.8 metres long overall, 132.9 metres perpendicular to perpendicular, speed of 13 knots. Built for 'Kelvin Shipping Co. Ltd.' which was one of three companies owned by Hogarth Shipping Co. Ltd. ('Hogarth1'), with Henry Hogarth & Sons Ltd. ('Hogarth2') the managers, all of Glasgow. Collectively known as Baron Line. (Miramar indicate, however, that the vessel was owned by Hogarth2 in 1966). The ship was registered at Ardrossan, Ayrshire, Scotland & managed by Scottish Ship Management Ltd., a Hogarth company. The owners of the Baron Line had, at one time, I read, a reputation for being 'economical' when feeding their crews, and, as a result, the line was nicknamed the 'Hungry Hogarths'. David Mills recalls (thanks David!) a particular voyage where the vessel was fitted out at Dagenham (River Thames, E. London) for a cargo of cars, on to Rotterdam & then to Long Beach, California. 'The weather in the North Atlantic was rough & the false decks had collapsed so the vessel discharged into the sea new Jaguar motor cars, which had been loaded first & which were about 2 feet high. Such a shame! We departed for Vancouver & various ports loading lumber for Durban then sugar back from there to', David thinks, Liverpool. The vessel visited Auckland, New Zealand, three times between Jul. 23, 1960 & Dec. 16, 1963. It was sold, in 1968, for about �520,000, to Bordagain Shipping Co. Ltd, of Monrovia. Liberia, & renamed Bordabarri. In 1978, the vessel was sold again, to 'Panangelos Shipping Corp.', of Piraeus, Greece, 'Krisko Maritime Ltd.' the managers, & renamed Sea Glory. From May 6, 1983 to May 8, 1984, the vessel was laid up at Piraeus. On Jun. 25, 1984, the vessel arrived at the Chittagong, Bangladesh, facilities of 'Salim & Bros', to be broken up. There seems to be very little WWW data available about this vessel. Can you add more? A quality image of Baron Wemyss? A cargo ship. From 1 (Douglas Steamship, Inchona nr. page bottom), 2 (same Inchona data 60% down), 3 (NZ), 4 [Inch Steamship, Inchona (3)], 5 (Miramar, link, you now must be registered to access). 468 ft. 8 in. long (142.85 metres) overall, 435 ft. 11 in. long (132.9 metres) perpendicular to perpendicular, speed of 15 knots, signal letter GGTA. Built for 'Atlantic Shipping & Trading Co. Ltd.' ('Atlantic'), of Cardiff, with W. J. Tatem Ltd. the managers. In 1969 the vessel was sold to Williamson & Co. Ltd. ('Williamson'), of Hong Kong, & renamed Inchona. But the vessel would seem to have been actually owned by 'Inch Steamship Company Ltd.' (a subsidiary of Williamson), which company ceased to be in 1966. The vessel was transferred to 'Douglas Steamship Company, Ltd.' ('Douglas'), of Hong Kong (but 3 says 'Lapraik, Douglas & Co.'). 'D. Lapraik & Co.' is however stated to be the vessel's manager in Lloyd's Register of 1973/74. Despite the many references to the ownership history as above, I have read a Google 'snippet' which indicated that the vessel was sold by Atlantic directly to Douglas, of London. The vessel visited New Zealand once, on Jul. 12, 1971. In 1975, the vessel was sold to 'Bardal Shipping Co.', of either Greece or Panama, & renamed Alekos K. It was sold again, in 1978, to 'Alkistis Shipping Co. S.A.', of Greece, & renamed Aries. On Apl. 25, 1987 the vessel arrived at the Alang, Gujarat, India, ship breaking facilities of 'Chaudhary Industries', to be broken up. Can you add anything! An ore carrier. From 1 & 2 (images Iron Barque, but you must be registered to see them), 3 (data, & image Iron Barque, 4th image down), 4 (Vallum ref. 40% down), 5 (image, Mahinda), 6 (Norwegian page, Mahinda), 7 (Miramar, link, you now must be registered to access). 157.5 metres long, speed of 13 knots. Built for 'Vallum Shipping Company Ltd.', of Newcastle, which company was owned by 'Common Bros Ltd.' & Jardine Matheson Limited. Vessel probably managed by 'Common Bros Ltd.' & likely chartered to British Iron & Steel Company ('Bisco') for its first ten years. The vessel was sold in 1970 to owners from Singapore (Ugland Group perhaps, maybe 'J. B. Ugland Shipping Singapore Pte Ltd.' or 'Ugland Shipping Co. A/S') & renamed Mahinda. In 1980, the vessel was sold by 'Ugland Shipping Co. A/S' to 'Landmo Shipping Corp. Ltd.', or maybe 'Landbo', also of Singapore, with no change of vessel name. On Apl. 1, 1987, the vessel arrived at Alang, Gujarat, India, to be broken up. Can you add anything! A bulk carrier. From 1 (data), 2 (data re vessel), 3 ('Booker' company history. The page had 4 images but you may need to be registered to see them), 4 (fine image, vessel plans), 5 (15 images, mainly 1960 shipyard interior images), 6 (Booker Line, Booker Venture), 7 (Miramar, link, you now must be registered to access). 143.0 metres long overall, 131.1 metres perpendicular to perpendicular, speed of 12 1/2 (or 13.5/14.0) knots, signal letters GHPB. Crew of 38. Built for 'Booker Ship Finance Ltd.', related to 'Booker Bros. (Liverpool) Ltd.', of Liverpool, for use in transporting sugar from 'Booker' plantations in British Guiana in season & for general services (iron ore, grain etc.) at other times of year. British Guiana became Guyana in 1966. In 1975, the vessel was transferred to 'Booker Merchantmen Ltd.' The company's plantations were nationalised in 1976 (not a success) & in the 1990s 'Booker' & 'Tate & Lyle' were contracted to manage the Guyanese sugar industry & successfully revived it. Booker Prize (relates). The vessel was lengthened in 1966, at Smith's Dock Company, North Shields, to 161.5 metres overall, 149.6 metres perpendicular to perpendicular. The vessel was sold, in 1978, to 'Transvenezuelan Shipping Co. SA', of Panama & renamed Caribbean Memories. And sold again, in 1980 (or 1981), to 'Thanic Shipping Co.', of Piraeus, Greece, & renamed Thanic. But maybe not! Maybe sold instead to Transmar Shipping Co. S.A., of Panama, having been part of a joint venture with Lidia Marine Corp. Dates do not jive perfectly, so I am not sure! The vessel was sold in 1986 to 'Pyramis Shipping Ltd.', of Valletta, Malta, & was renamed Trader. It must have been very early in 1986 because in Jan. 1986, the vessel arrived at Alang, Gujarat, India, to be broken up. Can you add anything! A bulk carrier. From 1 & 2 (images, Cheviot, thanks to Paul Strathdee), 3 (Ben Line, Cheviot), 4 (Miramar, link, you now must be registered to access). 160.0 metres long, speed of 12 knots. Built for Bamburgh Shipping Co. Ltd. ('Bamburgh'), of Newcastle, which company was owned by W. A. Souter & Company, of Newcastle. In 1976 the vessel was, it would appear, owned by 'Sheaf Steam Shipping Co.' ('Sheaf'), a company related to Bamburgh, it would seem. Both Bamburgh & Sheaf were taken over that year by Ben Line. In 1977, the vessel was sold to Greek owners, (which specific company?) & renamed Dapo Trader. And in 1984 sold (to whom?) & renamed Trader. In Jul. 1984, the vessel arrived at Set�bal, Portugal, to be broken up. Can you add anything! A refrigerated cargo ship. From 1 [Ulster Steamship, Torr Head (4)], 2 (image, Torr Head), 3 (Miramar, link, you now must be registered to access). 138.9 metres long overall, 455 ft., 129.6 metres perpendicular to perpendicular, speed of 15 1/2 knots. Built for 'Ulster Steamship Co. Ltd.', of Belfast, Northern Ireland, known as 'Head Line', G. Heyn & Sons the managers & most likely the owners also though I have not read that. Can anybody clarify? Was in service from Belfast & Glasgow to the U.S. & Canada, &, in later years, in joint service with associated company Donaldson Line of Glasgow (Head-Donaldson Line). Was modified to carry containers. In 1972, the vessel was sold to Ocean Tramping Co. Ltd., of Hong Kong, & renamed Shengli. But registered at Mogadishu, Somalia. In 1974, the vessel was sold to China Ocean Shipping Co., of Lu Ta, (i.e. Dalian, I believe), China, & renamed Yu Hong. And in 1999, the vessel was sold again, to Dalian Ocean Shipping Co., of Dalian, China, with no change of vessel name. I read that the vessel was scrapped in 1999. There is very little data WWW available about this vessel. Can you add anything! A bulk carrier. Per 1 [Ropner, Bridgepool (2)], 2 (Ropner, in panel, view it full screen), 3 (image, Bridgepool), 4 (image Ekton), 5 (Miramar, link, you now must be registered to access). 159.1 metres long, speed of 15 knots, signal letters GHYQ. Built for Pool Shipping Company (certainly in 1966/67), owned by Ropner Holdings Ltd. Registered at West Hartlepool. I have seen a Google 'snippet' reference to the vessel undergoing 9 weeks of repairs but 'with no prospect of profitable employment the 'Bridgepool' was moved in July 1975 to a lay up berth at Hartlepool. After being laid up for 4 months, the vessel sailed for Sunderland, where minor repairs were effected. And the vessel was then sold, late in 1975, to 'Orient Shipping Corp.', of Piraeus, Greece, & renamed Ekton. The vessel was laid up again in 1982. In 1985, the vessel was reported as being sold to Chinese ship breakers for a price in the region of $128 per ltd, & on Mar. 18, 1985 it arrived at Huangpu, China, to be broken up. Can you add anything! A bulk carrier. Per 1 [Trader Navigation, Middlesex Trader (2)], 2 (1969 collision), 3 (image, Middlesex Trader, but you must be registered to see it), 4 (the damaged Elisa F., but you must be registered to see it), 5 (Miramar, link, you now must be registered to access). 177.7 metres long, speed of 14 1/2 knots, signal letters GKZA. Certainly 14111 tons in 1966/67. Built for Trader Navigation Co. Ltd., of London. In 1969, the vessel was sold to Doric Shipping Corp., of Piraeus, Greece, & renamed Homer. In late 1969, likely with both vessels travelling fast in the fog, Homer was in collision with Elisa F., in the Thames estuary. Elisa F. suffered a very large hole in her hull (4) but did not sink. Homer, which also suffered major damage, (image at left), was repaired at Smith's, (of North Shields? ), it would seem. Homer was held to be at fault, I understand. In 1970, the vessel was renamed Assios. The vessel was sold again, in 1978, to 'Negocios del Mar S.A.', of Callao, Peru, & renamed Pollux. It would seem that the vessel was sold, in 1980, to undisclosed principals, for around $3.55 million, (can that be correct? ), with no change of vessel name. In 1984, the vessel was sold to Euston Shipping Co., of Valetta, Malta, & renamed Polo. On Mar. 28, 1985, the vessel arrived at 'Nickson's' ship breaking facilities at Alang, Gujarat, India, to be broken up. Actual break up commenced on Apl. 8, 1985. WWW data is really quite limited. Can you fill in the blanks or otherwise add anything! A bulk carrier. Per 1 (data, Ixia (4), 80% down), 2 (image at Sault Ste. Marie, Michigan, in Sep. 1982), 3 (image, Ixia), 4 (Miramar, link, you now must be registered to access). 181.4 metres (595 ft. 0 in.) long overall, 170.7 metres perpendicular to perpendicular, 560 ft. 0 in., speed of 14 1/2 knots, signal letters GPMA. Built for Stag Line Ltd., of North Shields, at a cost of �1,337,575. Joseph Robinson & Sons (Management) Ltd., also of North Shields, the managers. In 1965, the vessel discharged 23,191 tons of bulk grain at Liverpool, the largest such single shipment to have then been handled there. In 1982, the vessel was sold to 'Telemachus Shipping Co. S.a.r.l. ', of Lebanon, (for U.S. $2,850,000 less 3%) & renamed Telemachus. On May 20, 1985, the vessel arrived at Shanghai, China, to be broken up. WWW data is most limited. Can you add anything! A bulk carrier. Per 1 [Ben Line, Benhiant (2)], Benhiant), 2 (Miramar, link, you now must be registered to access). 617 ft. 0" (188.06 metres) long, single screw, speed of 14 1/2 knots, signal letter GNJE, with 7500 BHP Sulzer oil engines by George Clark (Sunderland) Ltd. Designed with the maximum possible dimensions to operate through the St. Lawrence Seaway ('Seaway'). Built for Northern Petroleum Tank Steamship Co. Ltd., of Newcastle, Hunting & Son Ltd. the owners & managers. Was soon transferred, it would seem, to 'Northern Petroleum & Bulk Freighters Ltd.' (no manager change). In 1966, the vessel struck the upper guide wall at Snell Lock, New York, (Seaway near Cornwall, Ontario). In 1969, the vessel was chartered by Hyman-Michaels Co., of Chicago, to carry scrap iron to Osaka & other Japanese ports. In or about 1970, the vessel required tug assistance after a grounding. Have not read where but in the Great Lakes or the Seaway. In 1973, the vessel was sold to E. G. Thomson (Bulk Carriers) Ltd. (William Thomson & Co.), of Leith (Edinburgh), Scotland, ('Ben Line') & renamed Benhiant. David Stewart of New Zealand advises, (thanks David! ), that he was a Deck Cadet in early 1973 when the ship, after dry-docking at Hamburg for major repairs, left for Providence, Rhode Island. En route, the ship was hit by a freak wave which put a massive crack in the ship's side & necessitated more weeks of repairs, this time at Boston. As David says 'An inauspicious start for Ben Line's first bulk carrier'. In 1974, the vessel was renamed Cramond. I wonder why it changed - a 3 year charter perhaps? It would seem there was no change of owners. A now dead site, 'shawsavillships.co.uk', used to tell of Cramond carrying plywood from Wakayama, Japan, to Inchon, Korea, were the vessel 'demolished the lock gates'. Temporary repairs were necessary before the ship could continue, & permanent repairs, I trust, were made to the lock gates! That same dead site also referred to some of the varied cargoes carried - wheat, plywood, steel bars, soya beans. The vessel's name reverted to Benhiant in 1977. David Walker advises (thanks, full text here) that the ship, known to the crew as 'The Black Pig', travelled from Emden, Germany, to Detroit with coal & then Thunder Bay & Duluth to Rotterdam with grain. It damaged its propeller at Detroit - temporarily repaired & eventually replaced at Rotterdam. Then tractors & steel from Antwerp to New Orleans where it had to anchor for 6 weeks in the Mississippi - thru Mardi Gras. Then grain to Burgas, Bulgaria, onward to Augusta, Sicily, in ballast & then the ship was sold, in 1978, to 'Dover Compania Naviera S.A.', of Panama, & renamed Alexandra. It was sold, in 1980, to 'Favor Cia. Maritima S.A.' of Piraeus, Greece, & renamed Fair Wind. And was sold for the last time, in 1983, to 'Column Shipping Co.', of Limassol, Cyprus. On Mar. 15, 1985, the vessel arrived at Shanghai, China, to be broken up. Despite the above, WWW data about the vessel is really quite limited. Can you add anything! Michael Foreman has kindly been in touch (thanks so much!) in essentially the following words:- Benhiant left Rosario with a cargo of wheat via Durban (arrived Durban Oct. 16, 1974) bound for China (a port near Tientsin). The ship lay anchored in Pohai gulf, top end of the Yellow Sea, just off the coast at the bottom of the river leading up to Tientsin, for many weeks, there were a great deal of other ships waiting at anchorage for their turn to dock. From China she went to Hong Kong where she was re-named Cramond on Dec. 29, 1974. I think the name change was so that it was not immediately apparent that the vessel had been trading into China, which could have caused a problem had she needed to go to Taiwan. From Hong Kong to Wakayama to take on plywood & then onto Inchon, South Korea. The lock gates & the ship were both damaged entering Inchon docks. The blame was apportioned fifty-fifty to the ship & the tug boat. She went back to Hong Kong from Korea to Taikoo dry-dock for repairs. After repairs she went light ship back to Japan. She picked cargo up in Chiba and Yokohama, steel bars mainly. The vessel left Japan for Vancouver Island, arriving there on Mar. 6, 1975. Under the name of Benhiant again she did a voyage from Avon mouth (in Avon mouth about May 21, 1977) to Hamburg and then up through the Great Lakes to Superior (opposite Duluth) returning through the Gt. Lakes across the Atlantic to Liverpool (in Liverpool Jul. 18, 1977). Can you add anything additional! There is a fine image of the vessel available, stated to have been provided by M. Donnelly. I am asked not to link to its source, but you can find it by a Google search for 'Wearfield Donnelly'. A cargo ship. Per 1 (image, Exning), 2 (splendid image & data, Maritsa III), 3 (Miramar, link, you now must be registered to access). 157.3 metres long overall, 516 ft., 146.3 metres perpendicular to perpendicular, speed of 16 (or maybe 17) knots, signal letters GNKE. The vessel was designed to carry vegetable oil hence two Lloyd's Register gross tonnages. Exning? A village in Suffolk, located close to Newmarket, where Mr. G. C. Gibson, the Chairman of Atlantic, & also of Tatem & Tatem Steam Navigation Co. Ltd., lived. Built for Atlantic Shipping and Trading Co. Ltd. ('Atlantic'), W. J. Tatem Ltd. ('Tatem') the owners & managers, both of London & Cardiff. Major repairs, probably in 1973, it would seem. The vessel was sold, in 1973, the very last 'Tatem' ship, in fact, to be sold, to 'Troodos Shipping', L. Haji-Ioannou, of Greece, & renamed Maritsa. In 1974, the vessel was renamed Maritsa III. In 1983, the vessel was sold again, to 'Milkyway SA', of Cyprus, & renamed Cyprus Trader. A year or so later, they sold the vessel to Pakistani ship breakers & on Apl. 6, 1985, the vessel arrived at Gadani Beach, Pakistan, to be broken up. Can you provide more data? A bulk carrier. Per 1 (Miramar, link, you now must be registered to access). 188.1 meters long overall 176.9 meters perpendicular to perpendicular, speed of 15 knots. Owned by General Carriers S.A., of Piraeus, Greece, (Chandris Group). The vessel was sold, in 1986, to 'Rehmat Maritime Ltd.', of Gibraltar, & renamed Rehmat. It was sold again, in 1987, to 'Wah Hau Shipping Inc.', of St. Vincent, & renamed Barkla. On Oct. 24, 1987, the vessel was wrecked in the East China Sea, NW of Taiwan, at 25.09.58N/121.43.11E. But... I have also seen a 'snippet' reference to United Ship Management Ltd., of Hong Kong, selling the vessel to Chinese ship breakers for a price in the region of $141.2 per ldt (light displacement tons perhaps?). So maybe the vessel survived the wreck? Can you explain? And provide more data? A bulk carrier. Per 1 (Wikipedia page re vessel & wreck), 2 (a 'pdf' file, what happened to Sygna, with images), 3 (the whole Sygna story), 4 (Miramar, link, you now must be registered to access). 217.3 meters long overall, 208.1 metres perpendicular to perpendicular. speed of 15 1/2 knots. Built for 'A/S Ludwig Mowinckels Rederi', of Bergen, Norway, & launched on Jul. 25, 1967. Fred Smith advises (thanks Fred!) that he worked on the construction of the ship, & that 'Austin & Pickersgill' did not have a slipway large enough to accommodate her. So she was built in two halves on the Wear & towed to the Tyne to be joined together at the Palmers Dry Dock in Hebburn. I had not read that data before. In May 1974 the vessel went to Newcastle, New South Wales ('NSW'), Australia, to load 50,000 tons of Hunter Valley coal for Europe. Late that month, severe storms hit the NSW coast of Australia. A warning was broadcast, & 7 of the 10 ships at anchorage at Newcastle went out to sea to ride it out. Sygna, which had waited 4 days to load, & was anchored about 3 miles off shore & 2 1/2 miles E. of the harbour entrance, did not immediately heed the warning. The largest swell conditions ever were seen at the port�s entrance. Captain Ingolf (have also read Reinart) Linde, 57 years old, did not hear the warning & went to bed at 10:00 p.m., leaving instructions to be awoken if required. Why ever did he do that in all of the circumstances? At 1:00 a.m. on the morning of May 26, 1974, he was awoken, far too late to be effective. Orders were given to move out to sea, but it was just too late. It took 45 minutes to raise the anchor! The vessel drifted in the 165 km/h winds, its giant hull acting like a sail. With its engines at full-ahead, the ship could make no headway. In desperation, Sygna tried to gain speed by running down-wind & then turning seawards, but that did not work out & the ship rammed herself ashore, on Stockton Beach, at 2:15 a.m. on May 26, 1974. No tug was, in all of the circumstances, available to assist Sygna which lost approx. 700 tonnes of oil during the incident, dispersed however by the heavy seas. Pounded by the elements, orders were given to abandon the ship. An unsuccessful attempt was made to get a line aboard the ship & a life boat rescue was attempted also. With great difficulty however, all 30 (or maybe 31) aboard were rescued by an Iroquois helicopter in near cyclone conditions. Flight Lieutenant Gary McFarlane, the pilot, was awarded the 'Air Force Cross' for his efforts that day & the outstanding conduct of his crew members were also recognised. The vessel was considered to be too large to salvage, was designated a constructive total loss & insurance monies were paid out. The wreck, as is was, was offered for sale. Not much interest in bidding, it would appear. It was sold to 'Taiseikaihatu Co. Ltd.' ('Taiseikaihatu'), of Japan, for $150,000. On Sep. 4, 1974, Taiseikaihatu commenced salvage operations with 'Kitoku Yamada', likely the company owner, in charge of the salvage activities. A difficult situation, I read, & surely not the finest exhibit for the behaviour of the Australian workforce, (sorry, but that seems to be so). The Japanese worked all hours to accomplish the task, while the Australian crews insisted on double time for normal hours & double-double time for shift work & took off what time their agreements permitted. During the course of those operations, the ship was swung around, the heavier stern section sank into deeper water & the ship broke its back. (It may be that it was broken in two much much earlier. A giant crack appeared in the hull at 7:30 a.m. on the 26th). The stern section was re-floated first, but went aground again & settled into the sand. Why? It would appear that due to an industrial dispute, no tug would come to tow it to Port Stephens & safety. How amazing! And how frustrating it must have been for Taiseikaihatu in its efforts to salvage the ship. It was, however, stripped of items of value. Efforts were made in Nov. 1974 to extricate the stern section but without success - and a heavy oil spill resulted. The bow was floated off successfully & winched out into deep water from where the oil drilling tender Lady Vera towed it to Port Stephens. I read that to Nov. 18, 1974, $1,600,000 was spent by Taiseikaihatu on the salvage operation, much of that sum going to Newcastle firms & workers with very little to show for it. The bow was left on anchor in Salamander Bay for almost 2 years until it was towed to Kaohsiung, Taiwan, where it arrived on Feb. 26, 1976, to be broken up. The stern of the ship still lies on Stockton Beach today, now badly eroded, 38 years after it ran aground. I gather that a Norwegian Court of Inquiry met to consider the disaster. Can anybody provide the resulting report? Which however would seem, surprisingly perhaps, to have found no fault with the ship's officers. It is interesting to note, per Fred Smith, that the ship would seem to have broken her back at the point where the 2 halves were welded together back in 1967. He wonders whether poor design or bad workmanship was the true cause of the vessel breaking her back in 1974 & whether, had that not happened, the ship would have been salvageable. Can you provide more data? Perhaps a large version of a fine image (see left) showing folks on shore holding a line from the ship when a rocket rescue of the crew was attempted. An SD-14 dry cargo ship. What a lot of names! Per 1 (Miramar, link, you now must be registered to access). 141.0 metres long, speed of 14 knots. Built for Greek owned 'Seaspray Marine Corp.', of Monrovia (Mavroleon Bros. the managers?). That name may rather be 'Mavroleon Brothers (Ship Management) Ltd.' Sold in 1978, but maybe rather just renamed Argolis (also Mavroleon). The vessel was sold, in 1980, for a price in the region of $3.95 million, to 'Alkaios Cia. Naviera S.A.', 'Lanaras & Paraschis', the managers, & renamed Anavissos. The vessel was sold, in 1983, to Atlantic Crown Maritime Co. Ltd. of Limassol, Cyprus, 'Vernicos Maritime' the managers, & renamed Mariner. Likely sold, in 1986, to Zamora Navigation Co. Ltd., & renamed Pigeon, Vernicos still referenced. The vessel was sold, in 1990, to 'Sea Trade & Construction', & renamed Susan Sea. It was sold, in 1991, to Hyundai International & renamed Vivari II. And sold again, in 1992, to Seamouth Shipping & renamed Armas. And sold for the last time, in 1994, to Trans Overseas Co., of Panama, & renamed Crest. But the vessel may not have traded as Crest. Arrived at Chittagong (Sitalpur), Bangladesh, at or about Jan. 31, 1995, to be broken up. Anything to add? An SD-14 cargo ship. Another vessel which had a lot of names! Per 1 [Larrinaga Line, Rupert de Larrinaga (2)], 2 (Larrinaga history, ref. to vessel 85% down), 3 (25% down), 4 (data & image, Agia Efimia), 5 (Miramar, link, you now must be registered to access). 141.0 metres long, speed of 14 knots. The first (or maybe the 2nd) Sunderland built vessel to have dual imperial & metric depth measurements marked on the hull. Built for 'Larrinaga Steamship Co., Ltd.', a tramp ship company, of Liverpool. Visited Auckland, New Zealand, on Oct. 5, 1972. The vessel was sold, in 1974, to 'Vergocean Steamship Co.', of London, owned by George Vergottis, who in 1975 renamed the vessel Vergray. However 2 states that the 1974 sale was to Valiant Steamship Co. Ltd., of the Vergottis Group. The vessel was sold, in 1978, to Atheras Shipping Co. Ltd., of Monrovia, Liberia & renamed Atheras. And renamed Afovos in 1986 & Atheras, yet again, later that year. Ownership changes? Also in 1986, the vessel was sold to 'Flandermar Shipping', 'Agoudimos & Meletis', of Greece, the managers & renamed Agia Efymia. But the vessel, apparently, was marked Agia Efimia. It was sold again, in 1991, to 'Selini Shipping Co. Ltd.', of Malta, 'Calais Shipping' or possibly 'Calais Shipping Inc.', of Piraeus, Greece, the managers, & renamed Virginia. On Dec. 11, 1991, the vessel was wrecked at Kilyos, 22 miles from Istanbul on the Black Sea coast of Turkey (west of the N. mouth of the Bosphorus). The vessel suffered an engine failure en route from Piraeus to Kherson, Ukraine, & ran aground. By Dec. 18, 1991, she had broken in two. Emre Berberoglu advises (thanks!) that the wreck was bought by a Turkish business man who intended to repair the ship & put it back into service. But a storm changed those plans & the vessel was accordingly scrapped where it lay. Most WWW references are to Rupert de Larrinaga. There are few references to later names. Can you help with additional data? An SD-14 cargo ship. Yet another vessel which had a lot of names! Per 1 (data in Spanish, Isabel Maria), 2 (link 1, Google translated), 3 (image, Cosmonaut), 4 (Miramar, link, you now must be registered to access). 141.0 metres long overall, 134.2 metres perpendicular to perpendicular, crew of 35, speed of 15 (or 14) knots. Built for &apos;Felix Scheder Bieschin & Co. GmbH KG&apos;, of Hamburg, Germany, & managed by 'K. G. Vineta Seerederei GmbH. ', also of Hamburg - but registered at Singapore. The vessel was sold, in 1980, to 'Seaward (or Seward) Maritime (or Marine) Inc.', of Panama, 'Wallen Shipmanagement Ltd.', of Hong Kong?, the manager, & renamed Lady Isabel. In 1985, the vessel was sold to 'Ultraocean S.A.', of Argentina, & renamed Isabel Maria. In 1989, the vessel was bare-boat chartered to 'Cormor�n S.A. de Navegaci�n', of Argentina, & in 1991 sold to them & renamed Dea - registered at Malta. Transferred? to 'Cormor�n S.A.', of Argentina, in 1994 & renamed Idea, still registered at Malta. Later in 1994, the vessel was sold to 'Eastern Spirit S.A.', of Panama, & renamed Dora. In 1995, the vessel was sold to 'Lincoln Maritime Corp.', of Panama, & renamed Amore. On May 23, 1996, the vessel arrived at ship breakers at Chittagong, Bangladesh, to be broken up. Now there are references to other names in the ownership history, so the above may well need correction. 'Infrutra G.m.b.H. & Co. O.H.G.' in 1980, as an example. Cromwell Shipping, of Malta, owning Dea & selling it to Greek interests, is another. Euston Shipping Co. Ltd. of Malta, selling to &apos;Eastern Spirit S.A.&apos; is a third. Can you correct the above and/or indicate the status of those various names? Or otherwise add to the record. An SD-14 cargo vessel. Per 1 & 2 (images, Dorthe Oldendorff), 3 ('pdf' file, Egon Oldendorff history, data & images Dorthe Oldendorff at WWW p.121), 4 (Miramar, link, you now must be registered to access). 141.0 metres long overall, 134.2 metres perpendicular to perpendicular, speed of 15 knots, 6 passengers. Originally ordered by 'Half Moon Shipping Co.', of Monrovia, Liberia. But the contract was acquired, in 1969, by 'Egon Oldendorff', of L�beck, West Germany & the vessel was delivered as Dorthe Oldendorff, the 3rd fleet vessel of the name. After delivery, Brown-Boveri supervisory & automation systems were installed at Bremerhaven. On Aug. 3, 1972, the vessel was transferred to 'Kommanditgesellschaft', 'Egon Oldendorff' the manager, both of L�beck. On Sep. 4, 1972, the vessel was transferred to 'Wursata Shipping Corporation', of Singapore, as bareboat charterers of the vessel. Have not read how long the charter was. In 1988, the vessel was sold, 'for a price in the region of $2.1m. ', to 'Sinzhong Lines Pte. Ltd.', also of Singapore, 'Lian Huat Shipping Co. (Pte.) Ltd.', the managers, & renamed Sinfa. It would seem that i) in Feb. 2001, the vessel was sold to Chinese ship breakers & ii) in Dec. 2002, the vessel arrived in China to be broken up. I am grateful for the extended data about the vessel's history, through 1996, at link 3. The above surely needs correction. Can you do so or add anything? An SD-14 cargo vessel. Per A (e-Bay image, Natal), 1 (data & image, Aliadrikni, do see it full size, but you must register to see it, for some reason), 2 (DAL history), 3 (Miramar, link, you now must be registered to access). 141 metres long, speed of 14 1/2 knots. Originally ordered as Arcadian Pride, by Vassiliki Colocotronis, of Greece. But delivered as Natal as the vessel began a 5 year charter to 'DAL Deutsche Afrika-Linien GmbH & Co.' ('DAL'), of Hamburg, Germany. At the end of the charter, in 1977, the vessel was renamed Jocasta (Miramar refer to 'J. Pournaras', the manager perhaps?) & in the next year, i.e. 1978, was sold to John T. Essberger, of Hamburg, Germany, (1 says 'linked' to John T. Essberger) & renamed Tibati - Singapore flag. It would seem that DAL was then & still is now a company owned by the privately held 'John T. Essberger Group of Companies'. The vessel was renamed Topega in 1984, & in 1985 was sold to Raynville Shipping Corp. SA, of Panama, Holbud Ltd., the managers, & renamed Aliadrikni. (References to 'B. A. A. Qawi' re Aliadrikni - can you explain?) The vessel was sold in 1995 to Blue Horizon Shipping Co. Ltd. of Malta ('Harmony Shipping') & renamed Harmony Breeze. On May 21, 1997, the vessel arrived at Alang, India, to be broken up. I saw a 'snippet' reference to 'Ocean Bridge Bulk Carriers, SA', of Panama, re this vessel but could not discern its meaning or date. Can you add anything? An SD-14 cargo vessel. Per 1 ('pdf' file, Egon Oldendorff history, image Hille Oldendorff at WWW p.123 & data at p.124), 2 (Miramar, link, you now must be registered to access). 141 metres long overall, 134.2 metres perpendicular to perpendicular, speed of 15 knots, crew of 21, 6 passengers. Originally ordered by 'Copacabana Shipping Co.', of Monrovia, Liberia. But the contract was acquired, in 1970, by Egon Oldendorff, of L�beck, West Germany. The ship's first owner was 'E. L. Oldendorff & Co. GmbH', of L�beck. After delivery, Brown-Boveri supervisory & automation systems were installed at Bremerhaven. On Jul. 5, 1973, the vessel was transferred to 'Partenreederei Egon Oldendorff', also of L�beck. On Aug. 15, 1973 the vessel became flagged at Singapore. In 1985, 'Westfalia Shipping Corp., of Singapore, (or maybe of Liberia), bareboat chartered the vessel. In 1987, the vessel was sold to 'Linksail Maritime Ltd.', of Hong Kong, 'McRink Management (Panama) Ltd. SA', the owners & managers, & renamed Lady Trude. In 1988, the vessel was sold to 'Chepo Ltd.', of Hong Kong, 'Gleneagle Ship Management Co. Inc.', the managers, & renamed Lake Tahoe. On Nov. 24, 1990, the vessel was arrested at Anna Bay/Cura�ao. In the spring of 1991, the vessel was sold to 'Laserway Shipping Ltd.', of Limassol, Cyprus, 'Ilios Shipping Co. SA';, the managers, (Miramar references C. P. Eliopoulos), & renamed Pantokrator Corfu. In 1993, the vessel was sold to 'Navalplanet Shipping Ltd.', also of Limassol, & renamed Feax - no change of manager. In 1995, the vessel was sold to 'Open Skies Shipping Co.' & renamed Sybille. Also in 1995, (or maybe 1996), the vessel was sold to 'Genesis Worldwide Shipping & Trading Ltd.', of Nigeria, & renamed Genesis Pioneer. The vessel suffered deck damage off the SW coast of France & arrived at Bilbao, Spain, for repairs on May 8, 1997. On Nov. 13, 1998, the vessel was arrested at Mumbai, India, & likely saw no more service. Since on Feb. 2, 1999, the vessel arrived at Mumbai ship breakers to be broken up. I am grateful for the extended data about the vessel's history, through 1996, at link 3. Miramar refers to other names - of managers I believe. Can you add anything? An SD-14 cargo vessel. Per 1 ('pdf' file, Egon Oldendorff history, image Imme Oldendorff at WWW p#122 & data p#121), 2 (Miramar, link, you now must be registered to access). 136.99 metres long overall, 134.2 metres perpendicular to perpendicular, speed of 15 knots, 6 passengers, signal letters DKEB/9VCJ. Originally ordered by 'Babitonga Shipping Co.', of Monrovia, Liberia. But the contract was acquired, in 1970, by Egon Oldendorff, of L�beck, West Germany. The ship's first owner was 'Kommanditgesellschaft' (can anybody explain that? Wolfgang Br�gger has now advised - thanks Wolfgang - that the word means a limited partnership, known as Egon Oldendorff Ltd. He adds that the family of Oldendorff had many business names & today are known as 'Oldendorff Carriers'), with Egon Oldendorff, of L�beck, the managing owner. After delivery, Brown-Boveri supervisory & automation systems were installed at Bremerhaven. On Oct. 13, 1972, the vessel was transferred to 'Partenreederei', no change of manager. On Dec. 7, 1972 the vessel became flagged at Singapore. In 1977, 'Holsatia Shipping Corp.', of Singapore, bareboat chartered the vessel. No manager change, thru 1980. In 1987, the vessel was sold to 'Skyriver Maritime Ltd.', of Hong Kong, 'McRink Management (Panama) Ltd. SA', the managers, & renamed Lady Aryette. In 1992, the vessel was sold, for $1.6 million, to 'Paloma Enterprise SA. ', of Panama, 'Everett Orient Line Inc.', the managers, & renamed Ivyeverett. Have seen 'Everett Steamship Corp.' of Japan, also referenced, which company sold the vessel in 1994, for $1.4 million, to 'DMS Nav. S/A', of Panama, (which company would seem to have been Greek owned), & renamed Techmat Pioneer. In 1997, the vessel was sold to 'N. R. Lootah Group', of Equatorial Guinea, & renamed Bin Lootah. On Jul. 19, 1999, the vessel arrived at Chittagong, Bangladesh, to be broken up. I am grateful for the extended data about the vessel's history, through 1996, at link 3. Miramar refers to other names - of managers I believe, & also to later changes. Can you add anything? An SD-14 cargo vessel. Per 1 (data), 2 (Feb. 1973 image Santa Clio), 3 (ref. 45% down Santa Clio), 4 & 5 (grounding), 6 (Miramar, link, you now must be registered to access). 141 metres long, speed of 15 knots. Originally ordered as Arcadian Chivalry, which name was changed to Santa Sophia. But delivered as Santa Clio to Imperia Delmar S.A., of Piraeus, Greece, (Vassiliki Colocotronis the owners or maybe the managers). Was chartered at some time to Hamburg South America Line. Sold in 1976, to 'Claus-Peter Offen', of Hamburg, Germany, & became Holstenbek. Sold in 1980 to 'Lemos & Houlis', maybe 'M. J. Lemos & Houlis Ltd.' ('Lemos'), & became Tiger Bay. Became Toros Bay in 1982, also Lemos. On Dec. 22, 1986, the vessel grounded hard on a reef E. of Cocos Island near the island of Guam in the western Pacific Ocean, with a cargo of ammonium nitrate & hexamethylene tetramine. Basswood responded to the incident. Vessel freed itself on Jan. 2, 1987, & was assisted in exiting the reef by a tow from Shinyo Maru. Minor damage to plates, interior damage 'more serious', no environmental damage. That all happened at 13.15N/144.38E. Vessel proceeded to Apra Harbor, a deepwater port on the W. side of Guam. On Apl. 13, 1987, arrived at Kaohsiung, Taiwan, to be broken up. Can you add anything? An SD-14 cargo vessel. Per 1 (image, Anna Dracopoulos), 2 (1987/88 image, Avance, & text), 3 (image, Floating Mountain), 4 (Miramar, link, you now must be registered to access). 141 metres long, speed of 15 knots. Vessel had quite a number of names in its lifetime. Initially named for the daughter of George M. Dracopoulos, of Myconos, Greece, i.e. Empros Lines, for whom the vessel was built. How does 'Tricampion Compania Naviera S.A.', of Panama, come into the picture then? Possibly the subsidiary company that actually owned the vessel? Renamed Avance in 1987. In 1988, when owned by Eurotraders Shipping (Maltese flag), the vessel was sold & renamed Advance, (Norbulk Shipping Agencies, of Glasgow, the managers). The vessel was sold in 1993, it would seem, (to whom?) & renamed Oonc Winner. Later in 1993, the vessel became the property of the Chinese Government, was renamed Floating Mountain & registered at Panama. The vessel was sold again, in 1998, to 'Sun Bright Shipping', & became Sun Bright. Became Bright Sea, in 2000, when owned by Mellum Maritime S.A., of St. Vincent & the Grenadines, ('Marine Fleet Management Pvt. Ltd.' the managers). I am grateful for the few data sources above because there is little WWW available re the vessel's history. On Dec. 15, 2001, the vessel arrived at Mumbai, India, to be broken up. Can you add anything? And correct the above. An SD-14 cargo vessel. Per 1 & 2 (images, Athanassia), 3 (Swedish page, 1996 collision, 20% down), 4 (bow damage Breitenburg), 5 ('pdf' file, ref. Vrissi, p.43), 6 (Miramar, link, you now must be registered to access). 141 metres long, speed of 15 knots. Built for Verde Shipping Co. Ltd. ('Verde'), of Piraeus, Greece - but registered, perhaps, at Panama? Vessel was sold in 1985 (to whom?) & renamed Lesvos. Now Miramar references 'Condellis family'; re both of the above - I think that the Condellis family were the owners of Verde & that 'Glafki Shipping Company S.A.' were the Verde managers. The vessel was sold, in 1986, to Saint Michael Shipping Co. ('Michael') & renamed Vrissi. Most WWW references to Michael are to a Piraeus, Greece, company of the name, however 5 indicates that the company, in fact, was Russian. Vrissi was in collision with Breitenburg, a German vessel, in good conditions, close to Cap Bon, near Tunis, Tunisia, on Mar. 16, 1986. At 37.07N/11.14E. Breitenburg suffered bow damage, while Vrissi had to be towed to Valletta, Malta, for dry docking & repairs. Vrissi was at fault, it would appear. The vessel was sold, in 1996, to 'Anglo Eastern Ship Management', probably the managers only, & renamed Gannet. There are a number of companies of that name, of Hong Kong, of Amsterdam, of India, etc. I wonder which one it was & who the new owner was? Perhaps that new owner was 'Gannet Shipping Ltd.' of the Bahamas? On May 23, 2000, the vessel arrived at the ship breaking facilities of 'Famous Shipbreaking Industries', of Alang, India, to be broken up. I am grateful for the few data sources above because there is very little WWW available re the vessel&apos;s history. And some confusion re the various names. Can you add anything? And/or correct the above? An SD-14 cargo vessel 'with additional cargo gear', i.e. a third mast in the middle. Per 1 (fine image, Belle), 2 (1999 grounding, Jang Dae San, bottom of Aug. list), 3 (SD14, incl. list, ref. 1974), 4 (Miramar, link, you now must be registered to access). 141 metres long, speed of 15 knots. Possibly designed for the carriage of bulk sugar. Built for Mauritius Steam Navigation Co. Ltd., of Port Louis, Mauritius, a company in which British India Steam Navigation Co. had an interest. Rogers & Co. were the managers. Vessel was sold in 1983 to 'G., J. & P. Margaronis', renamed Belle, & registered at Panama. Vessel was sold again, in 1991, to 'G. Dalacouras&' & renamed Katerina. In 1993, the vessel was sold to the Democratic People's Republic of Korea, (i.e. North Korea), renamed Ocean Ho, & registered at Honduras. It was probably owned by 'Korea Daesong Trading', of Wonsan, the state-owned shipping enterprise. The vessel was renamed Jang Dae San in 1999 ~ no change of owner. On Jul. 22, 1999, the vessel grounded 90 miles off Karachi, Pakistan, in heavy weather. At 23.35.45N/67.55.30E. Data about what happened then & later is scarce. It would seem, however, that the Pakistan Navy rescued 43 crew members from the ship by helicopter. And that the vessel later sank. And even later, in 2001/2, the vessel was broken up at nearby Gadani Beach, Pakistan. I am grateful for the few data sources above because there is very little WWW available re the vessel&apos;s history. Can you add anything? And/or correct the above? An SD-14 cargo vessel. Per 1 ('pdf' file, Egon Oldendorff history, image & history Eibe Oldendorff at WWW p.128), 2 (data, near page bottom), 3 (Miramar, link, you now must be registered to access). 141.0 metres long overall (have also read 136.98 metres), 134.2 metres perpendicular to perpendicular, speed of 15 knots, 6 passengers. Built for 'Westfalia Shipping Corporation', of Monrovia, Liberia (or of Singapore), (as bareboat charterers? ), Egon Oldendorff, of L�beck, West Germany, the manager. Does the above tell us actually who owned her? Registered at Singapore. The 2nd of 3 'Oldendorff' vessels of the name. In 1981, the vessel was renamed Splendid Fortune. No change of manager. In Sep. 1991, the vessel was sold to 'Delight Glory Shipping Ltd.', of Panama, with 'Parakou Shipping Ltd.' the managers, & renamed Delight Glory. Have also read that 'Yue Hai Shipping Co. Ltd.', of Panama, were the managers, perhaps the later managers. On Sep. 12, 1999, the vessel arrived at Calcutta, India, ship breakers to be broken up. I am grateful for the data about the vessel&apos;s history, through 1996, at link 3. Because there seems to be very little other WWW data. Can you add anything? An SD-14 cargo vessel. Per 1 ('pdf' file, Egon Oldendorff history, image & history Eibe Oldendorff at WWW p.128), 2 (Miramar, link, you now must be registered to access). 141.0 metres long overall, 134.21 metres perpendicular to perpendicular, speed of 15 knots, 6 passengers. Built for 'Arabella Shipping Co. S.A.', of Singapore, Egon Oldendorff, of L�beck, West Germany, the manager. Registered at Singapore. The 2nd of 3 'Oldendorff' vessels of the name. In 1981, the vessel was transferred to 'Holsatia Shipping Co.', of Monrovia, Liberia, & renamed Fair Spirit. No change of manager. In 1994, the vessel was sold to 'Halfmoon Shipping Corp.' also of Monrovia. In 1995, the vessel was sold or maybe was rather chartered to "Coreck" Maritime GmbH, of Hamburg, Germany. On Dec. 11, 2002, the vessel arrived at Mumbai, India, ship breakers to be broken up. I am grateful for the data about the vessel's history, through 1996, at link 3. Because there seems to be very little other WWW data. Can you add anything? An SD-14 cargo vessel. Per 1 ('pdf' file, Egon Oldendorff history, image & history Hinrich Oldendorff at WWW p.126), 2 (image, Martin, & data), 3 (brief ref. 45% down), 4 (Miramar, link, you now must be registered to access). 141.0 metres long overall, 134.2 metres perpendicular to perpendicular, speed of 15 knots, crew likely of 21, 6 passengers. Brown-Boveri supervisory & automation systems were installed, likely at Bremerhaven. Built for 'Holsatia Shipping Co.', of Monrovia, Liberia, Egon Oldendorff, of L�beck, West Germany, the manager. Registered at Singapore. The 2nd of 3 'Oldendorff' vessels of the name. Into a time charter upon delivery - to Oldendorff, I presume. In 1981, the vessel was renamed Happy Chance. I thought that might have been when the 3rd vessel of the name was built, but not so. In Dec. 1991, the vessel was sold to 'Martin Maritime Co. Ltd.', of Valetta, Malta, 'Meadway Shipping & Trading Inc.' the managers, & renamed Martin. In Mar. 1995, the vessel was sold, for U.S. $1.5 million, to 'Nika Shipping Ltd.', also of Valetta, 'Unit Maritime Inc.' the managers, & renamed Nika. On Feb. 27, 1999, the ship sustained a hole in its shell plating resulting in water ingress & some cargo (sugar) damage. Vessel put into Rio de Janeiro to effect repairs. On May 31, 1999, the vessel arrived at Calcutta, India, ship breakers to be broken up. I am grateful for the extended data about the vessel's history, through 1996, at link 1. Miramar refers to other names - of managers I believe. Can you add anything? A B26 Class bulk carrier. Per 1 (extensive data, fine images as Great Harmony & Anyaun 9), 2 (data, top item), 3 (fine image Great Harmony), 4 (Miramar, link, you now must be registered to access). 182.88 metres long, speed of 15 (or 14 1/2) knots. Built for 'London & Overseas Freighters Ltd.' which company, in 1981, was restyled as 'London & Overseas Freighters PLC', of London. Vessel was sold on Feb. 3, 1983, & renamed Olympic Phoenix, one of a group of 4 vessels sold for the total amount of $20.55 million, The other 3 vessels were London Earl, London Viscount & London Voyager. Through the 1980s, Olympic Phoenix frequently carried steel products to Great Lakes ports from Europe, & Canadian or U.S. grown grain on their eastbound voyages. That 1983 purchaser was, I believe, 'Portland Maritime Panama, SA', of Panama, with 'Olympic Maritime SA', of Greece, the manager. Vessel was sold, in 1992, to 'Tolmi Shipping Co. Ltd.', of Greece ('Allied International Navigation SA' the manager) & renamed Jeannie. As Jeannie, the vessel made further voyages to Great Lakes ports. Vessel was sold on Feb. 16, 1999 to 'Continuous Shipping Ltd.' of Malta, & renamed St. George A. Vessel was renamed St. George in 2000 & transferred to Panama registry. In 2001, the vessel was sold to 'Chios Pride Shipping & Trading SA', of Panama, with 'Harbor Shipping & Trading SA' soon the managers, of Greece and/or of Panama, & renamed Chios Sky. And sold again in 2003, or maybe on Jan. 19, 2004 to 'HK Da Hai Xiang Shipping', of China and/or of Panama & renamed Great Harmony. How did 'Great Master Maritime' fit into the picture? On Sep. 12, 2005, the vessel was sold to 'Hongkong Anyuan Shipping Co. Ltd.' of China and/or of Panama, for US $4 million & renamed Anyuan 9. With 'Cosnavi International' of Ningbo, China, the manager. This listing is added in Apl. 2009 when the vessel seems still to be in service. I am somewhat confused re the complicated history recorded above. So if you have the ability to correct the data and/or add anything, do please be in touch. A B26 Class bulk carrier. Per 1 (image & brief data, London Earl, 50% down), 2 (Miramar, link, you now must be registered to access). 182.88 metres long, speed of 15 (or 14 1/2) knots. Built for 'London & Overseas Freighters Ltd.' which company, in 1981, was restyled as 'London & Overseas Freighters PLC', of London. It would seem that the vessel ran aground in the St. Lawrence River off Pointe aux Tremble, Island of Montreal, in 1982, while en route from Thunder Bay, Great Lakes, to Hamburg, Germany. Vessel was sold on Mar. 22, 1983, & renamed Olympic Liberty, one of a group of 4 vessels sold in early 1983 for the total amount of $20.55 million, This one sold to 'Severna Shipping Panama S.A.', of Panama, (an Onassis Group company). The other 3 vessels were London Baron, London Viscount & London Voyager. In 1988, the vessel was sold to 'K/S Staberg', (Helmer Staubo & Co.) of Oslo, Norway, & renamed Staberg. The vessel was sold again, in 1995, to 'Alalma Shipping Co. Ltd.', (Seager Corporation, the manager), of Limassol, Cyprus & renamed Ithaki. She was eventually sold to 'Shri Ram' of India, & arrived at Alang, India, to be broken up on Dec. 22, 2001. A frequent visitor to Great Lakes ports during her lifetime, I understand. The WWW record for the vessel is most limited. If you can add anything, your contribution would be most welcome. An SD-14 cargo vessel. Per 1 (image, Qing Jiang), 2 (image Qing Jiang), 3 (SD14, incl. list), 4 ('pdf' file, ref. De Sheng break up, at page #36), 5 (Miramar, link, you now must be registered to access). 144 metres long, speed of 15 knots. Built for 'Matheson Shipping Co.' of London, or maybe rather 'Matheson & Co. Ltd.', owned by Jardine, Matheson & Co. of Hong Kong & London. In 1982, the vessel was sold to 'Guangzhou Ocean Shipping Company', (China Ocean Shipping Co. (COSCO), of Guangzhou), owned by the Government of the Peoples' Republic of China, & renamed Qing Jiang. In 2007, the vessel was renamed De Sheng. I read that on Mar. 21, 2012 the vessel arrived at Jingjiang, Yangtze River, China, to be broken up. While there are images, there is really very little data WWW available re the vessel's history. Can you add anything? And/or correct the above? An SD-14 cargo vessel, mark IV class. Per 1 (data & 4 images Browning), 2 (data & fine image, Ever Access), 3 (data & image Dae San, do see it full size), 4 (image Dae San), 5 (SD14, incl. list), 6 (Miramar, link, you now must be registered to access). 144 metres (477.44 ft.) long, speed of 15 knots. Built for Lamport & Holt Line Ltd., of Liverpool, controlled by the Vestey Group since 1944. Vessel laid up at Liverpool. In 1983, the vessel was sold to 'China Ocean Shipping Co.', (the Government of the Peoples' Republic of China shipping company? ), & renamed An Fu Jiang. Sold, in 1990, to Fortunate Star Marine Ltd. of Valetta, Malta, & renamed Fortunate Star. Have also read Safe Star, but I think that I either misinterpreted the data or the data was wrong. Later, in 1999, the vessel became owned by 'Ocean Join Shipping Inc.', of Panama, & was renamed Ocean Join. Sold by them, in 2004, to Good Fortune Shipping S.A., also of Panama, & renamed Ever Bright. Renamed Ever Access in 2005 or maybe 2006. Maybe sold to 'Daesan Shipping' of Pyongyang, North Korea, (Pan East Shipping Inc. the managers? ), in 2006 & renamed Dae San, a name not referenced by Miramar. Would still seem to be in operation in 2009. I am grateful for the few data sources above because there is very little WWW available re the vessel's history. Which history is so recent the data seems to be unavailable and/or in copyrighted sources. Can you add anything? And/or correct the above? A bulk carrier, ore strengthened. What a lot of names! Per 1 (image Kuiseb), 2 ($19.75 million, p.2), 3 (sale at $2.5 million, p.3), 4 (Miramar, link, you now must be registered to access). 179.0 metres long, speed of 14 1/2 knots. Built for 'Macedonia Maritime Co. (Ltd. or S.A.?)' a 'Fereniki Lines S.A.' vessel, of Piraeus, Greece. In 1994, the vessel was sold to 'Burdis Ltd.', of Hong Kong, & renamed Tiger Island. In 1997, the vessel was renamed Adriatic Bulker. Sold at that time? If you know do please advise. The next year, in 1998, the vessel was sold to 'Griffin Shipping' & renamed Griffin Elara. And in 1999 was sold to 'Fortuna Africa Maritime Co. Ltd.', of Malta, & renamed Fortuna Africa, Maltese flag. In 2001, the vessel was sold to either i) 'Millenium Maritime Services Ltd.', of Greece, or ii) 'Millenium Voyager Inc', of Liberia, or iii) 'Millenium Maritime Inc.' of the Cayman Islands, & renamed Millenium Africa. And in 2002 was sold to 'Enterprise Shipping Co. Ltd.', of Hong Kong, & renamed Enterprise. Later, in 2004, the vessel became owned by presumably other Hong Kong owners, & was renamed Claire. The vessel was sold, to 'Unicorn Shipping Pty', of South Africa, in 2005 (for $10 million) & renamed Kuiseb. And sold by them in Jun. (or maybe Aug. 2008) to Croatian interests for $19.75/$19.8 million. But that sale was not completed & it was later (Feb. 2009) sold to a Greek buyer for $2.5 million. The vessel may have ended her days, though Miramar does not reference a delisting. A most frustrating vessel to WWW research. There really are no info sources re this vessel. What I record above is essentially from 'snippets' of data, largely from 'Google Books', easily misinterpreted. The sources are recent, still in copyright & no 'snippet' sentence is complete. Can you add anything? And/or correct the above, because it surely is imperfect. A 'B30' bulk carrier, strengthened for heavy cargo. As for Fayrouz I above, what a lot of names! Per 1 (4 images Murmansk), 2 (Miramar, link, you now must be registered to access). 179.0 metres long, 170.01 metres perpendicular to perpendicular, speed of 14 1/2 knots. Built for Vassiliki Maritime Co. (Ltd. or S.A.?). a 'Fereniki Lines S.A.' vessel of Piraeus, Greece. In 1994, the vessel was renamed Tenka (Maltese owners or registered at Malta, perhaps). Also in 1994, the vessel was maybe sold to 'Burdis Ltd.', of Hong Kong, & renamed Tiger Bay. In 1996, the vessel became Torm Ceres. In 1997, the vessel was renamed Aegean Bulker, (have seen a reference to Korea). Sold at both times? If you know do please advise. Managed, it would seem by 'Aegean Bulk' of Athens, Greece. The next year, in 1998, the vessel was sold, for $11.5 million, 'by Korean interests', to 'Griffin Shipping Holdings' ('Griffin'), of South Africa, & renamed Griffin Aurora. In 2001, the vessel was sold by Merkland Ltd. ('Merkland') of Hong Kong, (I think that Merkland were managers for Griffin rather than owners) to 'Koma Shipping 2 Ltd.' of Malta, 'Koma Shipping Service Ltd.', of Murmansk, Russia, the manager, & renamed Murmansk. Registered at Valletta, Malta. The vessel was, per a now expired eBay reference, still in service in Mar. 2010. A most frustrating vessel to WWW research. There really are no info sources re this vessel. What I record above is essentially from a few 'snippets'; of data, mainly from 'Google Books', easily misinterpreted. The vessel is surely largely under charter, & may well have been renamed for the duration of a charter, which may account for some of the name changes. Can you add anything? And/or correct the above, because it surely is imperfect. An SD-14 cargo vessel, the very last SD-14 built by 'Austin & Pickersgill'. Per 1 (image, Odelis), 2 (image, data at page bottom, Theofilos), 3 (image, data, Theofilos), 4 (image, Marpessa E., & data), 5 (SD-14, incl. list 40% down), 6 (2009 collision), 7 (Miramar, link, you now must be registered to access). 144 metres long overall, 137.5 metres perpendicular to perpendicular, speed of 15 knots, signal letters 3FKO2. The vessel was built for Shipley Shipping Corporation, a company in the 'Wah Kwong Shipping Agency', of Hong Kong, group. Registered at Panama. In 1986, the vessel was sold to the Cuban Government, & renamed Rose Islands. The vessel was sold again, in 1998, to 'Rosario Shipping Inc.' of Panama, ('Poseidon' possibly the managers), & renamed Odelis. I read that the ship was laid up at Havana, Cuba, after May 2001, & was bought in 2005, for scrap, by Greek owners. That presumably relates to the vessel's sale, in 2005, to 'Poditi Holdings SA', of Panama, QIA Maritime, of Piraeus, Greece, the managers, & renamed Theofilos. The vessel was apparently not scrapped but was rather restored, over a 6 month period, by its Ukrainian crew. Was renamed Marpessa E. in 2007, when sold to 'Mikado Corporation' ('Mikado'), of ?, (Navegadora Transpacifica S.A., of Piraeus, Greece, the managers). Registered at Panama. 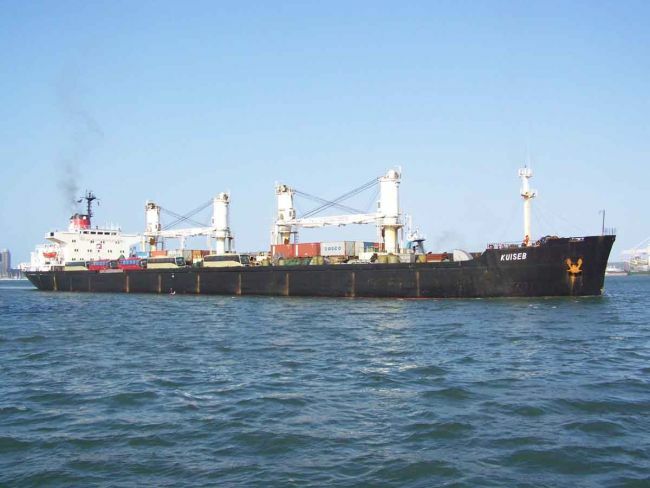 On Sep. 2, 2009, Marpessa E., under the command of Avraam Manousiadis, with a pilot on board, & en route from Nha Be to Khanh Hoi Port, Ho Chi Minh City, Vietnam, was in collision with Au Co 1, which was at berth & awaiting the unloading of its bulk cargo of urea. At 106.44.05E/10.45.60N. Au Co 1 was, it would seem, extensively damaged. Have not read about any damage to Marpessa E., which was at fault. Mikado apparently paid U.S. $309,265 in total damages. The vessel would still seem to be in operation in 2010. Despite the above, there really is very little WWW available about the vessel. Can you add anything? And/or correct the above? Vessels built by Austin & Pickersgill Limited at the South Dock yard that used to be owned by 'Bartram and Sons Limited'. Per Tony Frost, the hull numbers ran from #428 through to & inclusive of # 464. Miramar lists (highest hull number on page). It used to be that you could click on the links that follow & get to the relevant Miramar page. But no longer! The new procedure must be to go to Miramar (here) & log in (you must be registered to view any page). And once you are logged in, return to this page & all the following links should work for you:- 443, 464. And here. An SD-14 cargo vessel. Per 1 & 2 (Feb. 1975 images Santa Katerina), 3 (Mandarin Ocean, also 112609 Merrytrans), 4 (Miramar, link, you now must be registered to access). 141 metres long, speed of 15 (or 14) knots. Originally ordered as Arcadian Glory. But delivered as Santa Katerina to &apos;Transegeo Oceanica Navegacion S.A.&apos;, of Piraeus, Greece, (Vassiliki Colocotronis the owners or maybe the managers). Was chartered at some time to Hamburg South America Line. Sold in 1975, to 'J. Roth', & became Thomas Roth. Sold in 1984 to 'Good Harvest Maritime', & became Golden Antwerp. Became Rainbow Pride in 1987, for Kingstar Shipping Limited, of Hong Kong. In 1992 sold to 'Merrytrans Shipping Ltd.', (owned by the Chinese Government? ), renamed Merrytrans & registered at St. Vincent & the Grenadines. Renamed Mandarin Ocean in 1997. On Jan. 7, 1998, arrived at Calcutta, India, to be broken up. Am grateful for the data at Miramar because there seems to be very little WWW data about the vessel or its many owners. Can you add anything? An SD-14 cargo ship. Per 1 (1996, page in Portuguese, images), 2 (link 2 translated), 3 (image, Santa Maja), 4 & 5 (images, Al Johffa at Santos), 6 (Ruxpin), 7 (Miramar, link, you now must be registered to access). 141.0 (or 140.98) metres long, speed of 14 knots. Ordered as Arcadian Fame, which name, it appears, changed to Santa Amalia. But delivered as Santa Maja for 'Tridente Galante Navegacion S.A.', of Piraeus, Greece, (Minos Colocotronis & 2 nephews, the owners?). Was chartered at some time to Hamburg South America Line. Sold in 1976 to 'J. Roth', & renamed Claudia Kogel. Sold again in 1985, to Ruxpin International ('Holbud Ship Management', the managers?) & renamed Al Johffa. Registered at Panama. The webmaster has no ability in Portuguese but has tried, with the help of the Google translation, to understand, mainly at 1 & 2, the vessel's final weeks. The following may therefore contain unintended errors. In early 1996, Al Johffa left Mombasa, Kenya, in ballast, for Santos (S�o Paulo), Brazil, to pick up a cargo of sugar. It arrived at Santos on Feb. 9, 1996, & moored at the mouth of the bar, at or about 24.05.04S/46.19.09W. The weather was very bad. High winds & 4 metre waves. In the adverse conditions, the vessel dragged its anchors on Feb. 12, 1996, drifted out of control & beached about a hundred meters from the SE tip of the island of Palmas. Nobody was hurt. The ship, however, was badly damaged. It suffered a 15 metre gash in its port side & No 1 & 2 holds were flooded. It was hoped that the vessel could be refloated - oil was removed to prevent environmental damage. On Mar. 1, 1996, the owner, taking into account the advanced age of the ship, & the cost of refloating & repairs, decided to declare the vessel a constructive total loss. Titan Maritime Industries (or LLC), ('Titan') of Ft. Lauderdale, Florida, undertook the salvage work. On Mar. 20, 1996, the vessel was towed off with the assistance of tugs Phoenix & Bellatrix & moored for 5 days near Ilha da Moela. I presume that the insurers came to the same conclusion as had the owners, (yes? ), because on Mar. 24, 1996, the vessel was towed out to sea by Phoenix & was scuttled on Mar. 25, 1996, 120 miles off the coast. It sank, bow first, in 1200 metres of water. The circumstances are strange in that the press was not permitted to witness the final chapter. The sinking images are therefore courtesy of Titan. Can you add to, or correct, the above? An SD-14 cargo vessel. Per 1 (data, 30% down, image), 2 (data & image, Simara Express, 55% down), 3 (image, Tian Yuan Xing), 4 (SD14, incl. list 40% down), 5 (Port Klang, 1997, 45% down), 6 (Miramar, link, you now must be registered to access). 140.99 metres (462.5 ft.) long, speed of 14 1/2 knots. Vessel was built for 'London & Overseas Freighters Ltd.', of London. Visited Auckland, New Zealand, once, on Jun. 17, 1978. On Sep. 27, 1979 the vessel was sold, at a price above $4 million, to 'Clyde Maritime Ltd.', of Limassol, Cyprus, (Acomarit Services Maritimes S.A., of Switzerland, the managers), & renamed First Jay. In 1982, 'Abdul Lateef Jameel Establishment', of Saudi Arabia, became the managers. In 1986, the vessel was sold to 'Maunland Navigation Inc.', of Manila, the Philippines, with 'Vroon B.V.' the managers, & renamed Simara Express. Technical management of the vessel was transferred to 'Dalex Shipping', of Piraeus, Greece, in 1988. On Sep. 30, 1993, while en route from South Africa to Chile & Peru, the vessel encountered bad weather. A part of the cargo moved, & a container exploded & caused a fire. The vessel was examined, the damaged cargo was removed at Montevideo, Uruguay, & the ship continued its voyage. At Callao, Peru, with all cargo removed, the vessel was declared a constructive total loss with a repair cost higher than her value. In 1994 the vessel was sold, I read, to Greek buyers, & sold on to Chinese buyers for demolition. And renamed Tian Yuan Xing, registered at Kingstown (St. Vincent & Grenadines). She was not demolished, however, rather repaired. It would seem that 'An Da Shipping Inc.', of Belize, became her owner. Became An Shun, in 1996, & An Tai, later that year with 'An Tai Navigation Enterprises Ltd.', of Belize, her owner. On Nov. 24, 1997, while at her berth at Wharf 14, North Port of Port Klang, Malaysia, with a cargo of fertiliser (caustic soda, magnesium sulphate, soda ash & sodium sulphate) from Xingang, China, in part destined for Pasir Gudang in Johor, Malaysia, the vessel listed due to the cracking of her hull. And sank the next day. Crew of 25. A modest spill of heavy bunker oil & diesel resulted. Tenders were issued to raise her. In Feb. 2001, the vessel was cut in two, I read, in situ perhaps & the stern section was refloated. The above data may well need some correction. Can you add anything? An SD-14 cargo vessel. Per 1 (data, Asian Liner image, near page bottom), 2 (SD14, incl. list 40% down), 3 (image London Cavalier), 4 (image, Asian Liner), 5 (Miramar, link, you now must be registered to access). 140.99 metres (462.5 ft.) long, speed of 15 (or 14 1/2) knots. Originally ordered as London Halberdier, which name was later changed. Vessel was delivered to 'London & Overseas Freighters Ltd.', of London, as London Cavalier. Visited Auckland, New Zealand, once, on Jul. 23, 1977. On Oct. 9, 1979, the vessel was sold for about $4 million to 'Asian Maritime Corp', 'Philippine Pacific Ocean Lines', of Manila, the Philippines, & renamed Asian Liner. Mainly used on the 'Eurasian Express Lines' Western Europe to India/Pakistan service. The vessel was sold again, in 1980, for about $5 million, to 'Kanaris Compania Navegacion S.A.', of Panama, ('Companhia Portuguesa de Navegacao Ltda.' of Portugal, the manager), & renamed Silaga. In 1985, the vessel was transferred to 'Diamond Channel Shipping Corporation' of Panama. 'Kanaris Cia. Nav. SA', of Panama, somehow relates as do 'Componave' & Portugal also. On Jul. 9, 1986, the vessel was laid up at Lisbon, Portugal. Became Socrates, when sold in 1987 to 'Olympos Shipping Co. Ltd.' of Limassol, Cyprus, with i) 'Anpo Shipping Co. Ltd.', of Piraeus, Greece, or ii) 'A. G. Politis', of Greece, the managers? On Jun. 5 (have also read Jun. 11), 2001, the vessel arrived at Alang, India, to be broken up. Not a lot of data is WWW available about the vessel, all said & done. Can you clarify the names above and/or otherwise add anything? An SD-14 cargo vessel. Per 1 (Miramar, link, you now must be registered to access). 141 metres long, speed of 15 knots. Look at all of those vessel names at left! Somebody couldn't get their act together re the naming this vessel. They needed 3 names by the time it was delivered! Later sold, I presume, multiple times. Originally ordered as Arcadian Freedom, which name was changed to Santa Clio. But delivered as Santa Amalia to 'Transportes Surenos Armadora S.A.', of Piraeus, Greece, (Vassiliki? Colocotronis the owners or maybe the managers). Was chartered at some time to Hamburg South America Line, but not sure when. Sold in 1977, to 'Soutos Hellas', presumably also of Greece, & became Samos Progress. Sold in 1980 to 'Evolution Maritime', & became Fortune King. Became World Oceanic, in 1983, for Golden Navigation Co. We have barely begun with the names! Sold in 1983 to 'Samta Shipping Agencies' ('Samta') & renamed Hin Ann. In 1988, became Asean Pride, also 'Samta'. And became Asian Progress in 1990, yet again 'Samta'. In 1990, sold to 'Thai Shipping & Chartering', & became Silver Kris. In 1999 became Hie Khean. Now many of the above purchaser names may well be agents' names rather than owners' names, since Miramar seems to use the word 'owner' to mean the owner or the agent of that owner, interchangeably. I am grateful however for Miramar's data because it is, pretty well, all I can WWW find. Miramar advises that the vessel was deleted in 2004/5 but probably broken up in China in 2000. Can you add anything? An SD-14 cargo vessel. Per 1 [Jardine, Matheson, Cluden (2)], 2 & 3 (images, Transvaal), 4 (image, Colossus), 5 (image, Rich Ascent), 6 (Miramar, link, you now must be registered to access). 141.0 metres long overall, 134.2 metres perpendicular to perpendicular, speed of 15 knots. Originally ordered by Jardine, Matheson & Co. as Cluden, but the vessel was sold before delivery as Transvaal to 'Deutsche Afrika - Linien GmbH & Co.', (DAL), of Hamburg, Germany. Which company served East & South Africa & Indian Ocean ports. Was renamed Merlion, in 1976, of Singapore flag. With &apos;Transocean Liners (Pty.) Ltd.&apos; the managers. In 1980, the vessel was sold to &apos;Hua Pao Maritime Inc.&apos;, of Monrovia or perhaps of Panama, & renamed Colossus. Have seen references re that sale to i) Hong Kong interests buying the ship for U.S. $5.6 million, & ii) Wah Tung Shipping Agency, or Pan Wah Tung Shipping - possibly the managers? The vessel was sold again, in 1988, to 'Treasure Marine', possibly 'Treasure Marine (Pte) Ltd.', of U.S.A.?, & renamed Crystal. In 1994, the vessel was sold to 'Ocean Crown Development Ltd.', of St. Vincent and the Grenadines, & renamed Ocean Crown. The vessel was sold to 'North China Lines', of Cambodia in 1999 & renamed Rich Ascent. In 2001, the vessel was sold to 'Bestore Shipping Pte. Ltd.', also of Cambodia, & renamed New Moon. Registered at Belize. On Feb. 24, 2003, the vessel arrived at Jiangyin, on Yangtze river, China, to be broken up. Now most of the above data is from WWW 'snippets', so easily misinterpreted. Corrections in the text may therefore well be needed & are invited. Can you add anything? An SD-14 cargo vessel. Per 1 (data, 45% down, image), 2 (Swedish page, data 50% down), 3 (SD14, incl. list 40% down), 4 (Miramar, link, you now must be registered to access). 140.99 metres (462.5 ft.) long, speed of 15 (or 14 1/2) knots. Originally ordered as London Carabinier, which name was later changed. Vessel was delivered to 'London & Overseas Freighters Ltd.', of London, as London Bombardier. Vessel was sold in 1979 to 'Eaton Maritime Corporation', (not 'Easton' I believe), of Greece, 'Helikon Shipping Enterprises', of London, the managers, & renamed Akarnania. On Nov. 24, 1979, the vessel, while en route from Hamburg to Bremen, both Germany, was in collision with Membership & Kythera. A hole in the ship's starboard side was repaired at Bremen. Vessel was sold again in 1986 to 'Viking Traders Navigation Ltd.', of Limassol, Cyprus, 'Mayfair [Hellas] Co. Ltd.' the managers, & renamed Jute Express. On Jul. 28, 1987, while en route from Dunkirk to the west coast of India, the vessel was in collision with Pacific Confidence, in the approaches to the straits of Gibraltar. Some considerable damages it would seem, which were repaired at Piraeus, Greece, before the vessel continued on to India. And on Jan. 8, 1988, the vessel sprang a leak at Hong Kong & was repaired there. Became Ioannis I, in 1995, when sold to 'Euroferries', of Greece. On Apl. 10, 1997, the vessel arrived at 'MT Ship Breakers' facilities at Alang, India, to be broken up. Not a lot of data is WWW available about the vessel, all said & done. Can you add anything? An SD-14 cargo vessel. Per 1 (P&O, Strathdare), 2 (image as Nour), 3 (Miramar, link, you now must be registered to access). 140.98 (or 141.0) metres long, speed of 15 knots, complement of 32. Originally ordered by Quincy Chuang of Hong Kong, but order transferred to The Peninsular and Oriental Steam Navigation Co. Ltd. (P&O), of London. Sold by P&O in 1974, 5 days into maiden voyage, to Ellerman Lines Ltd. & became City of Exeter. The vessel was sold, in 1980, to Monodora Shipping Corporation S.A., of Monrovia, Liberia, & became Phoevos (Greek flag). The vessel was sold again, in 1982, to 'Islamic Investment Shipping Company One S.A.', of Panama, & became Safina-e-Barkat. Renamed Nour in 1985. The vessel was sold in 1995 to 'Garter Marine Ltd.', of Limassol, Cyprus, & became Zenith, & in 1999 was sold again to 'Third Element Enterprises Shipping Ltd.', of Nicosia, Cyprus, & became Nikolaos S. On Dec. 23, 1999, the vessel arrived at Haldia, (near Calcutta), India, to be broken up. Can you add anything? SD-14 dry cargo ship. Per 1 (P&O, Strathdoon), 2 (Miramar, link, you now must be registered to access). 131 (or 141.0) metres long, single screw, speed of 15 knots. Built for The Peninsular and Oriental Steam Navigation Co. Ltd. (P&O) of London. Some inconsistencies in the limited data. A now dead link stated that on Nov. 11, 1981 the vessel was sold to Birac Shipping Company S.A., of Panama, & renamed Emerald Islands. It would seem, however, that in 1987 (per another dead link) that the vessel was sold to Bettina Shipping Co. Ltd. of Valletta, Malta, & renamed Emerald Islands. The Government of Cuba would seem to have been involved at that time however - (Empresa Navegacion Mambisa (Government of Cuba), Havana, Cuba) - can anybody explain that involvement? Management changes in 1994 & 1996. Renamed Wavel in 1997. Also in 1997, the vessel was sold to Skimmer Ltd., of Malta, (Seabirds Management Inc., the managers) & renamed Skimmer (Panamanian flag). On Sep. 11, 2002, the vessel arrived at Gadani Beach, Pakistan, to be broken up. Can you correct the above data & provide an image? An SD-14 general cargo ship. Per 1 (data), 2 (Metcalfe Shipping Co. Ltd.), 3 (images stated to be an earlier (1971) Dunelmia, but if image at first thumbnail is correct, both surely look like the 1977 vessel. It would seem that you must register to see them), 4 (New Zealand), 5 (Miramar, link, you now must be registered to access). 141 metres long. David Fry advises that he 'joined Dunelmia�when she was about 6 months old late in 1977. At the time she was managed by Denholm�Ship Management of Glasgow. She was fitted with 2 jumbo derricks, a 100 ton on #2 hold and I think a 35 ton on #4'. At the time these were always stowed in the upright position against the masts. She also had a large palm oil tank in either #3 or 4 hold'.�(Thanks, David, for that info!). David also advises that my images, at left, may be of the incorrect Dunelmia - alas I don't have the skills to sort out which is which, particularly the many Dunelmia images that used to be available via 'Photoship'. The available data about the ship is quite confusing, to me at least, maybe resolved once I can access the applicable editions of Lloyd's Register. Built for Metcalfe Shipping Co. Ltd., or maybe 'Metcalfe Son & Co.' The vessel was sold in 1980 to 'New Panda Navigation S.A.' of Panama, maybe 'Sin Chiao Shipping' the managers, & renamed New Panda. Roy Muir advises (thanks Roy!) that he was aboard her when she was sold. 'Metcalfe�s sold her to pay the death duties when the owner died. We were at anchor up the Persian Gulf at the time. After the sale we went to Bunbury in Western Australia and loaded a cargo of titanium ore for Immingham. She was probably the happiest ship I have ever sailed in - so much so that when sold to Shaw Savill the entire deck crew stayed with her although having the option to pay off'. Roy mentions that the sale was to Shaw Savill, so I presume that Shaw Savill were the parent company of 'New Panda Navigation S.A.'? Shaw Savill were, it would seem, in turn owned by the Furness Withy Group. She was sold again, in 1985, & became Trade Fortune owned by 'Cafun Navigation S.A.' of Panama, maybe managed by 'Wah Tung Shipping Agency'. She was renamed Trade Fair in 1988 with 'Parakou Shipping Ltd.', of Hong Kong, the new managers. The vessel was sold again, in 1994, to Halldor Shipping Co. Ltd., of Bangkok, Thailand, maybe managed by 'Thoresen Bangkok', & renamed Halldor. On Apl. 9, 2002, the vessel was beached at Tapsakae ('Thap Sakae'? ), Thailand, to be broken up. Can you correct the above data, add details as required, & provide an image? An SD-14 cargo vessel. Per 1 (data, Strathdyce), 2 (SD14, incl. list 40% down), 3 (P&O, Strathdyce), 4 (image, Strathdyce), 5 (image, Komovi), 6 (image, Monte), 7 (Miramar, link, you now must be registered to access). 141.0 metres long overall, 134.2 metres perpendicular to perpendicular, speed of 15 knots, equipped with 2 Velle derricks, one of 50 tons & the other of 26 tons. Built for The Peninsular and Oriental Steam Navigation Company, (i.e. P&O Line), of London. In 1979, the vessel was sold to 'Prekookeanska Plovidba Bar S.A.', of Yugoslavia, or maybe of Bar, Montenegro, & renamed Komovi. In 1992, the vessel was sold again, to 'Bar Overseas Shipping Ltd.', of Valetta, Malta, 'Rigal Ship Management Ltd.', the managers, & renamed Monte. Tom Nicholson advises that the vessel was still in Lloyds Register in 2004, but no ship movements since 2001. It would seem that the vessel was broken up, in or about 2001, at Rizhao, China. While there are images, there is really very little data WWW available re the vessel's history. Can you add anything or correct the above? Vessels built by Austin & Pickersgill Limited at the Wear Dockyard that used to be owned by 'S. P. Austin & Son Ltd.'. Per Tony Frost, the hull numbers ran from #419 through to & inclusive of #436. Miramar lists (highest hull number on page). It used to be that you could click on the links that follow & get to the relevant Miramar page. But no longer! The new procedure must be to go to Miramar (here) & log in (you must be registered to view any page). And once you are logged in, return to this page & the following link should work for you:- 436. A collier. Per A (e-Bay image), 1, 2, 3 & 4 (all images, but you must be registered to view the last 2), 5 (Haweswater 1/2 down page, vessel launch & trials), 6 (Miramar, link, you now must be registered to access). 103.7 metres long, speed of 11 knots, signal letters GSMX. Built for 'Central Electricity Authority', which in 1957 became 'Central Electricity Generating Board', of London. The vessel was named for Sir William Walker of 'Naddle Gate, Burnbanks', Cumbria, indeed the vessel was launched by Mrs. Peattie, Sir William's daughter. Can anybody advise us about Sir William? There was a Sir William Walker who was mayor of Manchester in 1932-33, but that info may not be relevant. The vessel shipped coal to power stations around the U.K. coast, it would seem. On Nov. 23, 1983, the vessel arrived at the Vigo, Spain, ship breaking facilities of 'Rafael Diez Martinez', & break up commenced on Dec. 1, 1983. Can you add anything? A collier. Per 1 (image Ballylagan & interesting data re John Kelly), 2 (data, Kelly Line), 3 (image, Ballylagan), 4 (Miramar, link, you now must be registered to access). 72.5 metres long overall, 68.3 metres perpendicular to perpendicular, speed of 10 knots, signal letters GSSX. I saw a reference to the vessel having been ordered as Lisburn. True? Built for 'John Kelly Ltd.', of Belfast, Northern Ireland, a long established coal importing & distributing company then owned jointly by 'William Cory and Son Limited' and 'Powell Duffryn Ltd.' Surely engaged on the 'across the Irish Sea' coaling trade. The vessel was lengthened quite soon after it was built - in 1956 it became 254 ft. 6 in. overall (77.6 metres), 73.1 metres between perpendiculars & 1307 gross tons. In 1970, the vessel was sold to Shamrock Shipping Co. Ltd., also of Belfast, & was renamed Dynabulker. Have read the comment 'British then Irish Republic.' Can anybody explain? In 1971, the vessel was sold again, to 'Marine Enterprises (Malta) Ltd.', of Panama, (have also seen a reference to 'Maltese National Lines' of Valetta, Malta) & was renamed Nabulk. A reference to a new engine, made in 1961, fitted in 1975, built by Skoda, of Prague. That's essentially what it says! In 1975, the vessel was sold again, for about �60,000, to 'John Chryssoulis & Co. Ltd.', of Greece or maybe of Cyprus, & renamed Thalassitra. In Apl. 1980, the vessel arrived at the Piraeus ship breaking facilities of G. Panagiatopoulos to be broken up. Can you add anything? A collier. Per 1 (Stephenson Clarke data), 2 (Miramar, link, you now must be registered to access). 73.8 metres (241 ft. 11 1/2 in.) long, speed 11 knots, signal letters MTVZ. Built for Stephenson, Clarke & Co., of London. In 1968 the vessel was transferred into the name of Stephenson Clarke Shipping Ltd. May possibly have been cut in two & lengthened by 20 ft. in 1968 - at Humber Graving Dock & Engineering Company Limited of Grimsby - to permit the vessel to carry 120 more tons of cargo. The vessel was sold, in 1977, to 'Sassa Cia. Naviera SA', of Piraeus, Greece, & renamed Sassa. And sold again in 1980, to 'Tanit Shipping Co. SA', also of Piraeus, & renamed Agia Anna. In 1983, the vessel was sold to 'Vox Shipping Co. S.A.', of Panama, & renamed Trans Commerce. And in 1984 was sold for the last time to 'Cia. Naviera Sodnoc S.A.', of Sudan, & renamed Bint El Sheikh. Miramar reference 'El Hakim Trading Co.' of Port Sudan re that final sale. Perhaps they were the managers? On Mar. 6, 1985, the vessel arrived at the Gadani Beach, Pakistan, ship breaking facilities of Muzaffar Ahmed & Co. to be broken up. WWW data is modest, indeed. Do you have more data? A cargo ship. Per 1 (data, bottom item), 2 (Miramar, link, you now must be registered to access). 73.8 metres long, speed 10 1/2 knots, signal letters MTWC. Built for Stephenson Clarke Ltd., of London. In 1968 the vessel was transferred into the name of Stephenson Clarke Shipping Ltd. The vessel was sold in 1971 to John Kelly Ltd., of Belfast, & renamed Ballywalter. And was sold again, in 1979, to Oldham Bros., of Liverpool, & renamed Sallywalter. Miramar reference 'Frederick Oldham Ltd.' re that sale - perhaps they were the managers? The vessel was sold, in 1980, to Delta Marine Trading Co., of Alexandria, Egypt, & renamed Abeer Delta. No later data. But it would seem to have met its end in 1990. It was deleted from Lloyd&apos;s List in 1992. Do you have more data? A collier/coaster. Per 1 (image, Arundel, but you must be registered to see it), 2 (Miramar, link, you now must be registered to access). 104.8 metres long overall, 99.1 metres perpendicular to perpendicular, speed 10 1/2 knots, machinery aft, signal letters MXBJ. The last steam collier built in the U.K. Built for 'Stephenson Clarke Limited', of Newcastle, which company in 1968 became 'Stephenson Clarke Shipping Limited'. Said to be the oldest U.K. shipping company in existence, (dates from 1730). They were also, I read, one of the largest coal factoring companies in the U.K. The vessel commenced service chartered to the 'Central Electricity Authority' which became 'Central Electricity Generating Board' in 1958. Presumably to carry coal from the North East (have noted cargoes from Blyth), to power stations (including Shoreham, Kent), in the S. of England. In 1972, the vessel was sold to 'Gino Gardella', (later 'Gino Gardella Officine Navali' & 'Gino Gardella S.p.A.'), of Genoa, Italy, & renamed Brick Dodicesimo. On Jul. 17. 1983, the vessel arrived at the La Spezia, Italy, facilities of 'Terrestre Marittima', to be broken up. There seems to be little data WWW available about this vessel. Do you have more? A collier. Per 1 (whole page devoted to Findon, many images), 2 (Miramar, link, you now must be registered to access). 344 ft. long, speed of 10 1/2 knots. It would seem that the Doxford engines initially gave trouble. Built for Pelton Steamship Co. Ltd. ('Pelton'), of Newcastle. And chartered to Stephenson Clarke Limited, or maybe Stephenson Clarke Shipping Limited, ('Stephenson'), also of Newcastle. The vessel was used to transport coal from the north east to power stations on the Thames & to other such stations on the S. coast, also to Immingham (near Hull) & also to Farge & Emden, both in Germany. But not only coal - her cargoes included timber, pit props, sulphur, China clay & even liquid gas, for which she had to be especially adapted. 'Not an easy ship to handle', I read. Pelton went into voluntary liquidation in 1961 & Rondo was bought by Stephenson & renamed Findon, (the name of a village in West Sussex). The vessel travelled extensively including to E. & W. coasts of North America. One voyage was from Nova Scotia, Canada, to Ghent, Belgium with a cargo of timber. It encountered a hurricane off the Florida coast. I read that she broke down in the Bristol Channel on one occasion & had to be towed to port to effect repairs. On another occasion she lost one of her propeller blades & had to run at low speed to reduce vibration - & later in that voyage lost part of her timber on deck when the cargo lashings gave way in rough seas. The vessel was sold in 1973, to 'Andromyk Shipping Co. Ltd.', of Famagusta, Cyprus, & renamed Indon. Later that year she was sold again, to 'San East Marine Corp. S.A.', of Panama, & renamed San Shine. Became Triumph Ace in 1977, owned by 'Triocean Shipping Co. Ltd.', also of Panama. On Sep. 27, 1977, while on her first voyage as Triumph Ace, en route, in ballast, from Kaohsiung to Keelung, (Jilong or Chilung), both Taiwan, the vessel went aground, on rocks in the vicinity of Kin-San-Fu Kwei Chaio, near Keelung, northern Taiwan. At 25.18N/121.31.48E. She must have been a constructive total loss because she was broken up right where she lay. Much of the above information comes from 2 & from its many contributors - thanks so much! Do you have more data? And does anybody have a way to contact via e-mail John Boyle of Launceston, Tasmania. A collier. Per 1 (Miramar, link, you now must be registered to access). 103.4 (or 102.42) metres long, speed of 12 knots. Built for Newbigin Steam Shipping Co. Ltd., of Newcastle. The vessel was sold, in 1964, to 'Shipping & Coal Co. Ltd.', of London, & renamed Queensland. It was sold again, in 1976, to 'Bahia Shipping Enterprises Corp.', of Piraeus, Greece, & renamed Pambola. In 1981, the vessel was sold to 'Astarte Shipping Co. SA', of Panama, John Skouras, of Piraeus, Greece, the manager, & renamed Astarte. In 1983, it was renamed Maya, when sold to Maleth Shipping Co. Ltd., of Valetta, Malta, & in 1985 was renamed Gulf Carrier, when sold to 'Prosperity Shipping', of Athens, Greece. In 1988, the vessel was sold to 'Asian Lines Overseas Inc.', of San Lorenzo, Honduras, & renamed Kalam & in 1989 sold to owners from United Arab Emirates, & renamed Sea Trans I. The vessel was wrecked, on Jun. 6, 1989, at 11.45N/51.17E, which seems to be SW of Ireland in the North Atlantic. But I have also read that it was wrecked off the Horn of Africa. on Jun. 3, 1989. I have not read the circumstances or if there was any loss of life. Most of my info was from eBay items. Do you have more data? A collier. Per 1 (Miramar, link, you now must be registered to access). 73.8 metres long (242 ft.) overall, 70.4 metres perpendicular to perpendicular, speed of 10 1/2 knots. Built for Stephenson Clarke Ltd., of London. 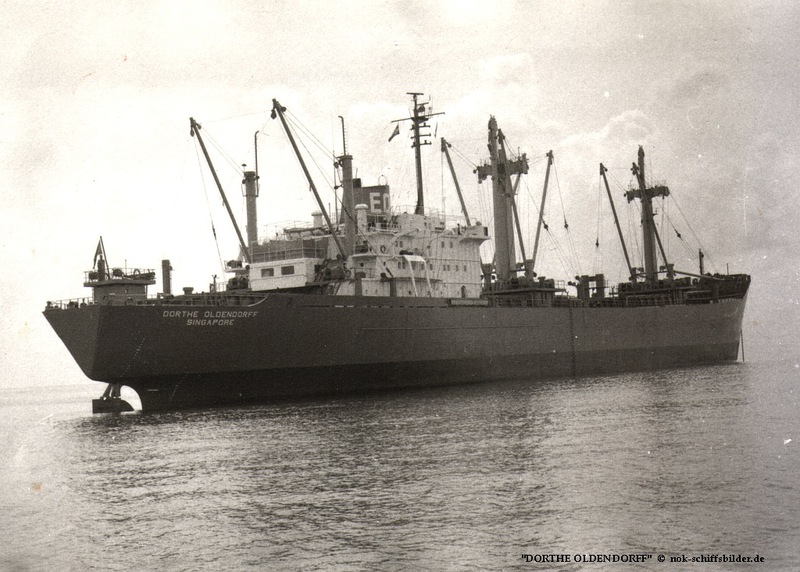 In 1968 the vessel's owner became Stephenson Clarke Shipping Ltd. Regularly loaded at Goole. In 1969, the vessel was lengthened, I believe at South Shields. It became 79.9 metres long overall, 76.5 metres perpendicular to perpendicular & 1765 gross tons. The vessel was sold, in 1978, to 'Alvar Ollson' of Varberg, Sweden, & renamed Landing. Laid up from 1986? It would seem that 'Lotus Shipping Ltd.' ('Lotus'), of Piraeus, Athens, Greece, or maybe of St. Vincent or perhaps the ship was registered there, must have owned the vessel. It was sold, in 1989, by Lotus to 'Bounyatsa Maritime Inc.', of Greece, & renamed Galini. The vessel's end may have been in 1999. Have read no details. WWW data re this vessel seems to be non-existent. Most of my info was from Google 'snippets', easily misinterpreted. Can you provide more data? A cargo ship. From 1 [Manchester Line, Manchester Faith (1)], 2 [Cairn Line, Cairnesk (4)], 3 (5 images, at half down page), 4 (image Manchester Faith), 5 (Miramar, link, you now must be registered to access). 378 ft. 2 in. (115.3 metres) long, speed of 15 knots. Laid down as Cairnesk for Cairn Line. But completed as Manchester Faith for Manchester Liners Ltd., of Manchester, for their Great Lakes service re the 1959 opening of the St. Lawrence Seaway. In 1965, the vessel was chartered to Cairn Line for a year & was renamed Cairnesk for the duration of the charter. The name reverted to Manchester Faith, presumably at the end of the charter. The vessel was sold in 1970, to Marlineas Oceanicas SA, of Monrovia, Liberia, & renamed Ilkon Tak. It would seem that there was some kind of arbitration in 1973 respecting Ilkon Tak (page bottom here). The vessel was sold, in 1979, to Yakinthia Shipping Co. SA, of Panama City, Panama, & renamed Chryseis. On Oct. 16, 1982, the vessel arrived at Karachi, Pakistan, to be broken up. Two other vessels named Ilkon Dalio & Ilkon Polly, both listed on this site, were, it would seem, owned by Brandts (Leasing) Ltd., of Liberia. That name might also relate to this vessel. Can you add anything! A cargo vessel. Per 1 (Manchester Liners, Manchester Fame), 2 [Cairn Line, Cairnglen (3)], 3 (4 images Manchester Fame, 80% down), 4 & 5 (images Manchester Fame), 6 (scrapped 1985), 7 (Miramar, link, you now must be registered to access). 115.3 metres (378 ft. 2 in.) long, speed of 15 knots. Have read a couple of references to Manchester Liners' vessels rolling in the open ocean, perhaps because designed with a relatively flat bottom to permit entry into Great Lakes ports. Laid down as Cairnglen for Cairn Line. But completed as Manchester Fame for Manchester Liners Ltd., of Manchester, for their Great Lakes service re the 1959 opening of the St. Lawrence Seaway. In 1965, the vessel was chartered to Cairn Line for a year, & was renamed Cairnglen for the duration of the charter. Name reverted to Manchester Fame, presumably at the end of the charter. The vessel was sold in 1970, to 'Mercaminos Surenos Navegacion S.A.', of Liberia (maybe Greek owners), & renamed Ilkon Niki. It was sold, in 1959, to 'Tranquil Marine Inc.', of Panama, & renamed Efi. It was sold again, in 1980, to 'Seatime Shipping Inc.', of Panama, & renamed Panagis K. Miramar advises that the vessel was in a collision at Alexandria, Egypt, on Jan. 23, 1981. It would seem to have occurred in heavy weather with North Wave. Panagis K. was arrested, lay idle, went aground, was abandoned by its crew, & stripped by vandals of its usable parts. It was auctioned off in situ for scrapping on Oct. 12, 1985. Do you have more data? A collier. Per 1 (image, Greenland), 2 (fine 'Frank F�rst' image, Chios Aeinaftis, on the beach on Mar. 19, 1989), 3 (Miramar, link, you now must be registered to access). 86.87 metres long, speed of 14 1/2 knots. With many of these vessels, it is most difficult for the webmaster to know where correctly to list them. This ship is a perfect example of the difficulties. Tony Frost advises that Greenland 'was built at the Southwick yard and barged down in bits and assembled on the slip way at the Wear Dock yard. I watched the launch.' Owned by Shipping & Coal Co. Ltd. of London. The vessel was sold in 1980 to 'Acta Shipping Co. S.A.', of Chios, Greece, & renamed Chios Aeinaftis. It was wrecked, on Oct. 26, 1981, at Pellestrina Island, Chioggia, part of the island barrier that protects Venice, Italy. The vessel had arrived in ballast at Chioggia from Benghazi, Libya, & while anchored off Chioggia awaiting a loading berth, dragged her anchor in very bad weather conditions & ran aground on Pellestrina Island. Jon Alcibar has kindly been in touch (thanks so much!) to provide an image (4th image at left) of Chios Aeinaftis high & dry on the beach at low tide at 'Pelestrina, Venize' in May 1996. Do you have more data? Is the wreck still there in 2016, I wonder? Vessels built by Austin & Pickersgill Limited at Southwick but assembled, launched & completed at the Wear Dock Yard that used to be owned by 'S. P. Austin & Son Ltd.'. Per Tony Frost, just a few such vessels. 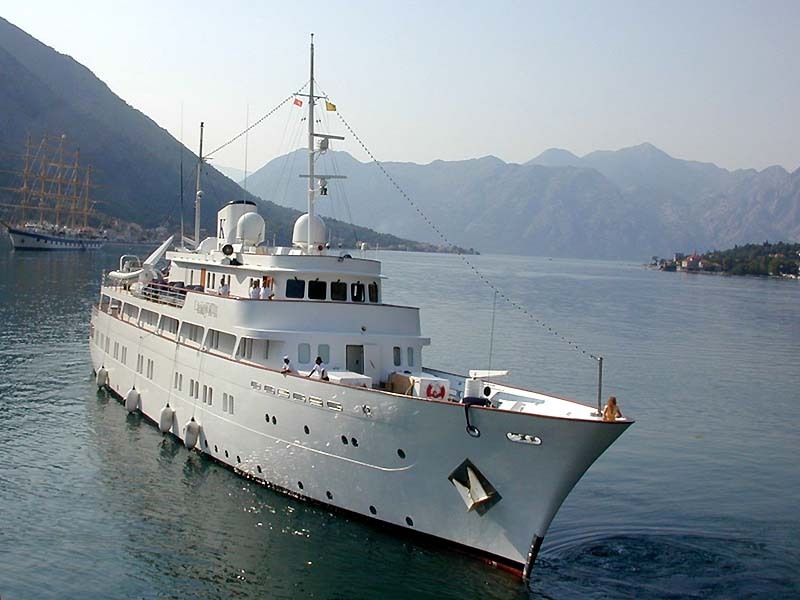 In addition to the vessel below, Suniper & Bobbina, both luxury yachts & Greenland, a collier. All assembled at Wear Dockyard in order not to occupy the slips at Southwick, which slips were needed for larger vessels. And also, per John Oliver, D607 & D606 in Mar. 1960 - two oil barges for Shell Petroleum of Valparaiso. John advises that Suniper was launched on May 1, 1962 for E. Parkinson of London & that Bobbina was launched on Mar. 11, 1963 for R. Bearman. Thank you John! I hope I have added your data in the correct spot! A luxury motor yacht. Per 1 (a current page on the yacht), 2 (data & 4 images), 3 (French page, 4 images Lady K II, 80% down), 4 (Miramar, link, the 1961 item, you now must be registered to access). 188.98 ft. long, speed of 10 (max. 14) knots, accommodation for 18 guests, crew of 21, 2 Sulzer diesel engines, range of 5,000 miles. But such numbers vary - e.g. have read a maximum speed of 12 knots & differing stateroom/guest capacity. Built for Basil M. (Manuel) Mavroleon, (1901/1979), retired 1965), a millionaire Greek ship owner & a U.K. citizen, who was Chairman of 'London and Overseas Freighters Ltd.', owners (or maybe part owners) of Austin & Pickersgill Limited. It would appear that the vessel was fabricated at Southwick & the sections floated down river to Wear Dockyard, for installation, likely in the dry dock there, thru to delivery. Launched on Mar. 29, 1961 (beer all round!) & delivered on Jul. 16, 1961. It cost, it would seem, �1,344,000 (have also read �400,000). I would be surprised if Mr. Mavrolean owned the vessel personally (rather than through a holding company) but have not seen any references to such a company. I read that the Mavroleon family had an earlier yacht named Radiant, hence Radiant II. A few snippets of data I have been provided:- i) The vessel contained 70 tons of ornamental brass, ii) antique Japanese tiles were used in Mrs. Mavroleon's bathroom, iii) the crew were instructed to daily screed the shell plating to cover the welded seams & paint over before sunrise, to keep the shell in a perfect white smooth condition. I am advised that on one occasion, a junior engineer got mixed up with the valves of the pressurised sewage system - & he ejected, under compressed air, the contents of the sewage holding tank back up into the accommodation. Everything had to be replaced. Now Miramar does not reference any later names for the yacht. It was however, I believe, in sequence, Lisboa II, Princess Tanya, & Lady K II. But, the various dates of sale & renaming at present elude me. In 1963, I read, however, that the vessel, then Lisboa II, was owned by Orisdan Shipping Co. SA ('Orisdan'), of Panama, with Piraeus, Greece, its home port. Orisdan would still seem to have owned the vessel (same name), in 1979. American publisher Walter H. Annenberg (The Philadelphia Inquirer, TV Guide, etc.) is said to have owned the vessel. And the Liveras family, when named Princess Tanya. It was sold, in 2005, for U.S. $15,950,000 & renamed Lady K II. To whom? The vessel would seem to have gone through three refits, see 2, most recently by 'Psarros' (2006/7), at Pieria, Greece, & at �ibenik, in Croatia (2005/6). In 2009, the vessel was still operating in the Mediterranean, registered at Panama, & was a popular charter yacht. But you would have needed to break open your piggy-bank to charter her! It cost U.S. $370,000 to charter her for a week. The yacht was used (I believe) in the movie 'Onassis: The Richest Man in the World' (1968) re Aristotle Onassis. It would seem that the vessel 'fell into disrepair' until 2012 & was sold again that year. And in 2013 it was being refitted in the U.K. The above listing has been advanced with the assistance of 2 friends of the site. The WWW record for the vessel is modest & often confusing. On May 7, 2013 a 14 page brochure re Princess Tanya was sold via eBay, in a listing which included 8 images. It is possible that visitors might wish to see those listing images:- 7, 8, 9, 10, 11, 12, 13, 14. If you can add to or correct this listing, do please be in touch. An amusing tale, for your pleasure & entertainment. But first a truly fine image of USS Abraham Lincoln (CVN72), an aircraft carrier of 77,000 gross tons, built in 1989 at Newport News Shipbuilding Inc., of Newport News, Virginia. The image, provided by the 'Navy Office of Information', 'Department of the Navy', used to be visible in a giant size on 'Flickr' - but is available there no longer. Photographed in the Arabian Sea, on Dec. 5, 2010, while conducting flight operations. BRITISH: Please divert your course 15 degrees to the south to avoid a collision. U.S. NAVY: This is the Captain of a U.S. Navy Ship, I say again, divert YOUR course. THIS IS THE CAPTAIN OF THE AIRCRAFT CARRIER USS LINCOLN, THE SECOND LARGEST SHIP IN THE UNITED STATES ATLANTIC FLEET. WE ARE ACCOMPANIED BY THREE DESTROYERS, THREE CRUISERS AND NUMEROUS SUPPORT VESSELS. DEMAND THAT YOU CHANGE YOUR COURSE 15 DEGREES NORTH, THAT'S 15 DEGREES NORTH, OR COUNTER MEASURES WILL BE UNDERTAKEN TO ENSURE THE SAFETY OF THIS SHIP. WE ARE A LIGHTHOUSE. YOUR CALL. The story gave me a chuckle! You too? If, but only if, you want a little more:- the Canadian equivalent is here. And there is much more about the story here. I did a 'Round the World Sunshine Cruise' on Hughie Hogarth's Baron Pentland (2) in 1961/62. As galley boy. I can't give you any technical info on the ship, but I'll give you a rundown of the voyage. The whole crew were gathered from Prescot St. Pool, London, and sent by train from London to Harwich ferry to Hook of Holland then train to Bremen, each of us given 10 bob 'subsistence' as the journey was less than 24 hours. A motley bunch of Scots, a couple of Londoners, a Latvian and a Falkland Islander. The Master was Kane (Caine?) from the Isle of Man as was the 2nd Mate, the Captain's nephew. The Mate was Gordon from Pitlochry. C/E Alan McLean was from Greenock. We loaded phosphate in Bremen for Auckland, New Zealand. (I don't think there can be two ports further apart) via Panama. After discharging part of the cargo in Auckland we proceeded to New Plymouth with the remainder. We were the only ship in that port for 3 days until HMNZS Taranaki arrived in her 'home port' on her maiden voyage. Fun and games in town that night! Were then ordered to South Australia to load grain, on the way there one of the A/Bs went down with appendicitis - we made 'best speed' for Eden, Victoria, where he was put ashore. Then on to Thevenard, S.A., which at that time had about six houses and a phone box. We spent 21 days loading then along to Adelaide to 'top off'. From there to Mozambique where we anchored off from Xmas Eve until the 7th of Jan. 62 when we went alongside in Beira to discharge. It was only a short run down the coast to Louren�o Marques to load iron ore for Japan stopping for bunkers at Miri, Borneo. On into the South China sea where we were caught in a typhoon. It's only now that I realise I was too young to be scared. But no worries, the Sunderland built ship seen us through it!!! In Japan we discharged cargo in Amagasaki, the only time in my life I had seen iron ore going in one end of a factory and Nissans coming out the other! From there it was south again to Townsville, Queensland, to load sugar for LEFO (Lands End For Orders) stopping in Singapore for bunkers. Then through the Suez Canal and into the Med. Somewhere around Biscay we were ordered to Liverpool where we paid off. I left home a pimply boy and came home 'Jack the Lad'!!! Quite an adventure for a 16 year old!